I said in my UTA 2017 write up that I wasn’t going to even think about doing UTA in 2018. That turned out to be incorrect—I am thinking about it. I haven’t bought an entry and I’m not going to buy an entry before April. 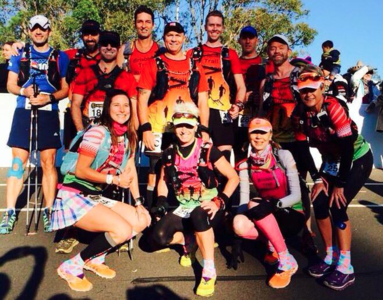 But loads of my running friends are doing it, and it would be great to join them! To that end, I decided I’d start on the Hanny training plan again in December. That went well for a couple of days until I felt like I’d fallen off the back of the training plan and I never really caught back up. There are two big problems for me this time around: my motivation doesn’t feel as high, I’m just not ready to spend six days a week training; I don’t feel able to do the amount of running without injury—my Achilles was definitely causing me some grief in January. I started at a new gym at the tail end of 2017, at Endure Performance in Bowen Hills. It’s not the most convenient gym for me, but I can pop in on the way to work or the way home from work easily enough, it’s a 20 minute detour on foot. I’ve also found that from work to the gym can be walked in about the same time as it takes by train, so I do that now unless it’s very hot. I asked Dale, one of the two coaches, if he would come up with an alternative training plan for UTA 100, and that is what I’ll be using for the next 15 weeks. The training plan is two strength and conditioning sessions, a cross training session (I do stretch and core at the gym) and then one to three runs a week. This is very low volume for me, but as I’m enjoying the gym more than the running at the moment, it’s not really a problem, as long the plan works. It’s not really saving me much time—I’m just spending five hours a week going to the gym (including travel time). I still don’t plan on doing UTA unless I meet my personal goals—if I don’t think I’m capable of achieving the silver buckle (14 hours, half an hour quicker than last year) then I won’t go. Hopefully the plan will pay off, give me confidence that I have the base speed, and if all goes well, I’ll pick up a spare entry in April. If my results are good, that’ll show that the plan works. If the results aren’t good, it could be the plan, or it could be me having a bad day, or doing nutrition wrong or any of the other countless contributors to poor performance. 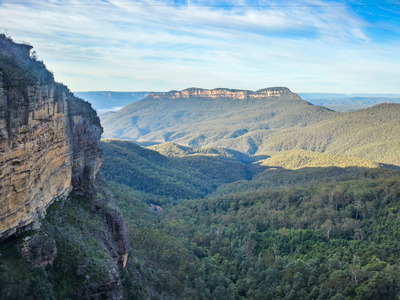 But I’m keen to try a different approach and hopefully the worst that will happen is a slow day in the beautiful Blue Mountains. I’ll start thinking about other goal races once I know what’s happening in May—if I don’t feel ready, I’ll do a later race, but I may well do a later race too. I’d love to get my body back to being capable of doing a marathon justice again too, I’ve struggled with long flat runs since late 2015, hopefully all this strength and mobility work will get my body back to being prepared for that. As race day drew nearer, and the forecast for the weekend got more and more locked down, I started to get a little worried as to what would happen with the race. 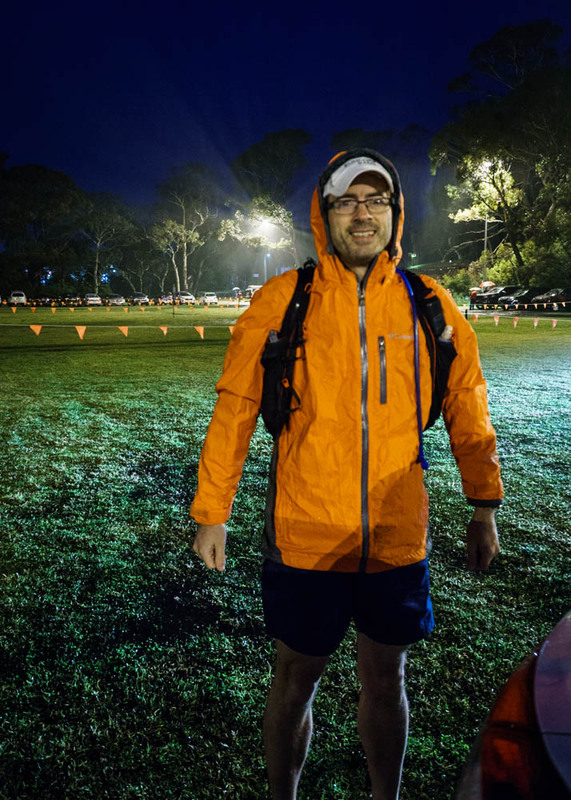 Personally, I don’t mind getting even very wet, as long as I can keep moving, I’m unlikely to get too cold in Australia during the day, and the mandatory gear is more than enough to keep me warm even if a cold snap arises. However, I foresaw two problems—the slipperiness of the course, and the creek crossings around the 90km mark when it’s dark and legs don’t quite work well enough to balance across the stepping stones. 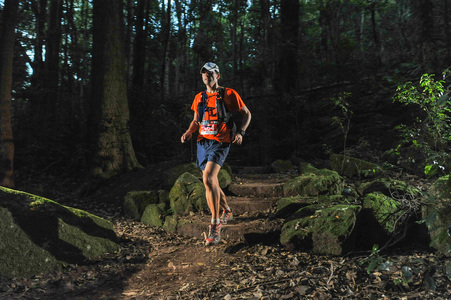 With up to 40mm of rain predicted for Friday night, the Catchment Authority wouldn’t permit the race to cross the creeks, and the race organisers had to then rewrite both the 50km and 100km routes to take that into account. In addition, Ironpot Ridge was removed from the course—it’s technical on the top but the descent is very steep and would have turned into an muddy slide incredibly quickly. Without the last 22km the race would be very different, and I wasn’t really sure whether my desire of sub-14 would be diminished on the changed course if it became significantly easier. 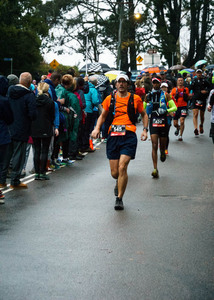 The morning of the race was cold, dark and raining—we parked the car in a muddy field and hoped for the best and walked to the start under an umbrella. The rain stopped about 5 minutes before my start time, and so I stuffed my jacket into my race vest back pocket. I said my goodbye to Peta and was ready to go. The first four km out and back were comfortable as hoped, at which point I saw Peta again and gave her a quick kiss as I went past, as I wouldn’t see her for another 7 hours or so, and then it was on to Furber Steps and down. There was a little bit of a bottleneck through the landslide and beyond, but I just kept comfortable before overtaking people. I should do better at passing people though, often it’s just a matter of asking to squeeze past. Golden Stairs felt good, a little queued towards the top, but not too bad. Once onto Narrowneck it was all cruisy, a quick top up at the checkpoint and then onto Tarros Ladders 10km later. There was a small queue, I figured less than 5 minutes queueing wouldn’t do my race much harm, compared to the worry of stacking it on the alternative route. There were some pretty horrendous stairs after the ladders, and it was here that I realised that all my training on the very well groomed Jacksonia steps wasn’t entirely realistic preparation. I’ll have to write to Brisbane City Council to get them to stop fixing them up, they’re far too nice. Some more climbing and easy trails later and I was at the second checkpoint. Missing out on Ironpot Ridge shortly after the second checkpoint made for a real shortcut, reducing the distance down to the next checkpoint to about 12km. After the paddocks came the long ascent up Megalong Road, quickly followed by a long descent down again. This year more sections felt runnable, and I was able to maintain a descent jog on gentle uphills, which meant the pace was much better. 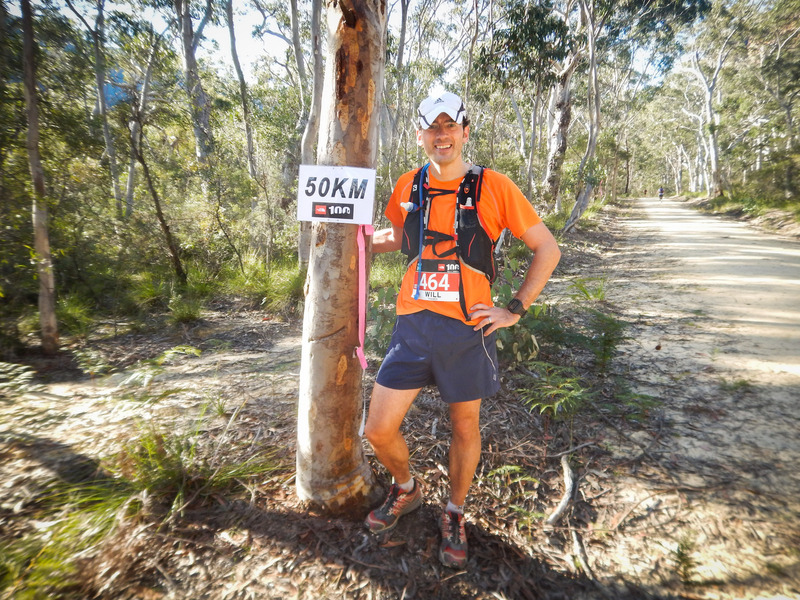 The long run down started to feel a lot more like a chore towards the end, and I was feeling somewhat glad that I wouldn’t have the 10km of descent down Kedumba! At checkpoint 3 I realised I had some blisters that were rapidly deteriorating. This was mostly due to the newbie error of failing to clip a toenail. I tried to self fix but it didn’t feel at all sufficient, so had a quick trip to First Aid where they patched me up far better—that blister didn’t give me any more grief after a couple more kms, so a big thank you to the First Aider! A good few kms running got me to Nellies Glen, where some of the rerouted 50km runners started to overtake—apologies to the 2nd and 3rd places, I knew they were behind me but clearly didn’t quite get out of their way quickly enough, as they did tap me to get past, just as I was about to move (partly I just thought they were impatient 100km runners, hadn’t realised they were speedy 50km runners) From the top of Nellies Glen some more easy running got me to the Aquatic Centre for my first checkpoint with Peta. I had fairly simple support crew needs this year—two bottles of 3 scoop tailwind swapped at both supported checkpoints. I did patch another blister, the last such patching required, and also changed my socks. But I tried to get in and out as quickly as possible. From the Aquatic Centre it was on to Echo Point, where Natalie, a friend who’d done the 22 the day before, spotting me passing and made for an impromptu cheer squad. From there we missed the usual fun of Giant Stairway for a run along the Prince Henry Cliff Walk instead. It was much easier and less technical, and barely much more populated. Some minor bottlenecks formed, so it was a matter of passing when possible, and maintaining a good pace. I heard a few complaints about steps as we headed down the Pools of Siloam, but you hear those every year—one day such people will do what I have done and embrace the stairs as the thing that makes UTA what it is. We saw the front runners just after we passed the descent to Leura Cascades, down which they were about to head for their last 7km. A quick water top up at Fairmont before heading down towards Lilians Bridge (crossing the path of the first female on her return before the descent) and then around the diversion to Edinburgh Castle Rock before returning uphill to the Conservation Hut, then onto Wentworth Falls themselves. A lot of this section was very runnable, as long as you avoid the giant trip hazards, and I made the most of it. From the falls there was a very nasty section out that made for very awkward passing, heading up to the road where things got easy again—first along Little Switzerland Drive and then the more suburban roads before hitting Tableland Road for the run into Queen Victoria Hospital. Peta drove past and gave me some encouragement “Are you ok? Why are you walking?”—“It’s a hill”. She also passed on my brother’s support, which was great. I hoped Peta would be able to park before I got to the checkpoint—she could, but it was irrelevant because I then found out I had to do a 3km loop before using the checkpoint. As I was out of tailwind at this point, this was quite demoralising. I knew they’d have to make up distance at some point, but it would have been good to be better prepared for when that would be. A 3km run later, and I was back, for refuelling, high viz vest on, lamp on head, ready to go. Once I’d run back along the road, and then onto Little Switzerland Drive, the two way traffic started to become more obvious. Everyone was fairly courteous, and tried to keep out of each others way. 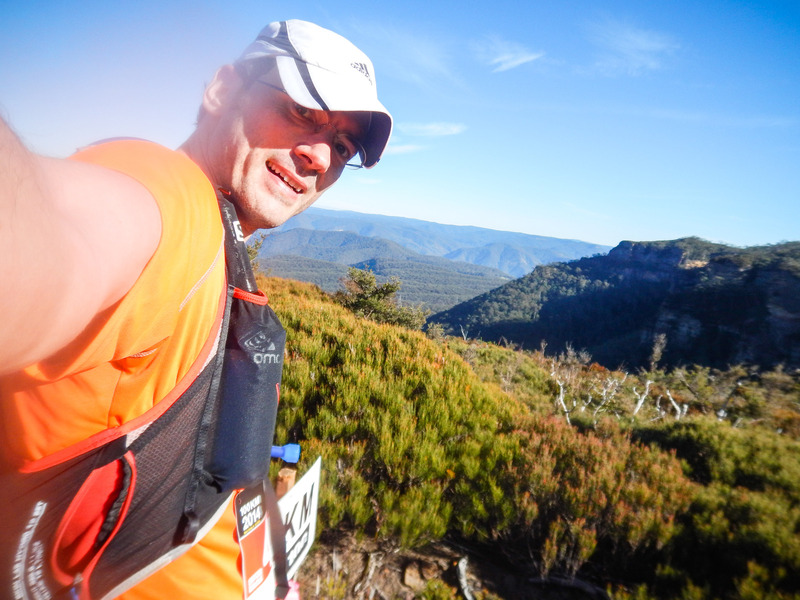 The last bit down before Wentworth Falls was a horrible section but luckily I caught it at a relatively quiet time. It was much more difficult to do even the wider paths with people coming the other way, trying to avoid tripping over steps, while your night vision gets ruined every time your lamp hits a high viz vest. There were a few welcome sections where we travelled a different path on the way back, but for the first few km, these were few and far between. Everything seemed to be much quicker on the way back until Fairmont, mostly because we took a much longer route on the way out. But at Fairmont I was told there were 13km to go. This was an unwelcome surprise, my watch was telling me I had 10km. The end of the race unravelled a little from there on in. The psychological blow that I’m a little further from the end really took it’s toll, particularly as the timings for sub 14 hours became incredibly tight at that point. Having said that, I remember staying behind someone for a while when I should have overtaken them—I was getting mentally fatigued and struggling to push myself. Much of the next 10km or so was spent trying to keep running the runnable stuff, and push on past people, in both directions. I gave someone the least comforting advice ever on this run. Coming down some stairs towards me, they said “This is going to be awful going up”—to which I responded “Oh, that’s ages away yet, you’ll have forgotten about it by then”. And then followed up with “Sorry, that really wasn’t very helpful”. Once down Leura Cascades it was one way traffic again. One of my knees was starting to ache going down ladders at this point, but I knew these were the last downward steps so just had to hope they’d be fine going up—they were. The 6 or so from the bottom seemed to take an age, but it always does, it’s really a slog uphill to the bottom of Furber Steps. The track was well worn already, and I slipped a couple of times but not too badly, but I felt sorry for the people who’d be following up to 14 hours later after another 1000 people had gone through. I let Peta know I was running later than expected, and then carried on. The km markers kept counting down. At 1km to go I thought I might just make 14:30, but it took a while to get to the bottom of the steps, and then I slipped on the 3rd bottom step. Once started though, I just kept on pushing like a man possessed. It was like my race was just to get me to the bottom of the steps so that I could get to the top as fast as possible. While I wouldn’t say I enjoyed them, I enjoyed that my body was still able to power its way up them. I overtook 10 people on the step section, the last five of which were probably the ones just before the boardwalk. I did realise as I got to the boardwalk that I wouldn’t quite make 14:30, but really that was just another arbitrary goal post that had moved along the way. Finishing was amazing as always. 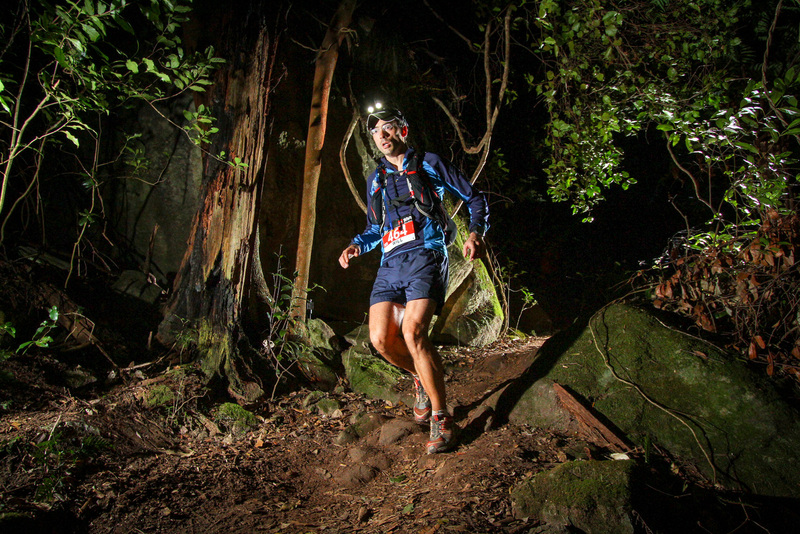 People often say that everyone goes through a low point during an ultra where they want to stop. I never wanted to stop. I wanted it to be over, through finishing, but I never had doubts as to why I was there (it was my choice, go me and my brilliant choices!) or wanted to quit (or, memorably, give up Trail running as I did in the 50km event four years previously). My new beautiful watch probably contributed to some of my malaise. I was confident it wouldn’t over count distance, but it almost certainly did, and made me think I’d got further than I had. This coupled with a lack of regular race distance info (there were signs but because of the course changes the didn’t always have the actual distance run) certainly threw some mental challenges my way. Congratulations to the race organisers for taking circumstances very much beyond their control and still managing to put on two great races. 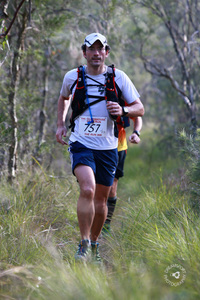 Thankfully the 100km wasn’t too badly affected, the last 20km were very different but it was still a great 100km race. Thanks to Hanny Allston and Find Your Feet for so generously making her UTA 100 training plan freely available—I’ve been almost religiously following it, avoiding races that don’t meet the training criteria. I did make some tweaks to suit my needs (move the rest day after a big Saturday run from Tuesday to Monday) but it’s been such a useful resource. Thanks to Troy Lum at Coach2Run for being my personal trainer, particularly those weeks where my training plan had a Saturday strength session and he rearranged his life to fit my session into his normal day off. Some of his advice has really helped put the training plan into perspective too and made the difference between an awkward difficult session that perfectly meets the plan vs making the best of what’s locally available, which will be good enough and not take 2 hours extra. Finally, Peta was there for me as usual. Being support crew must be so tedious, she had an early start driving me to the race for 6am, followed by waiting for the start at 6:33, then waiting for me to return 4km later. 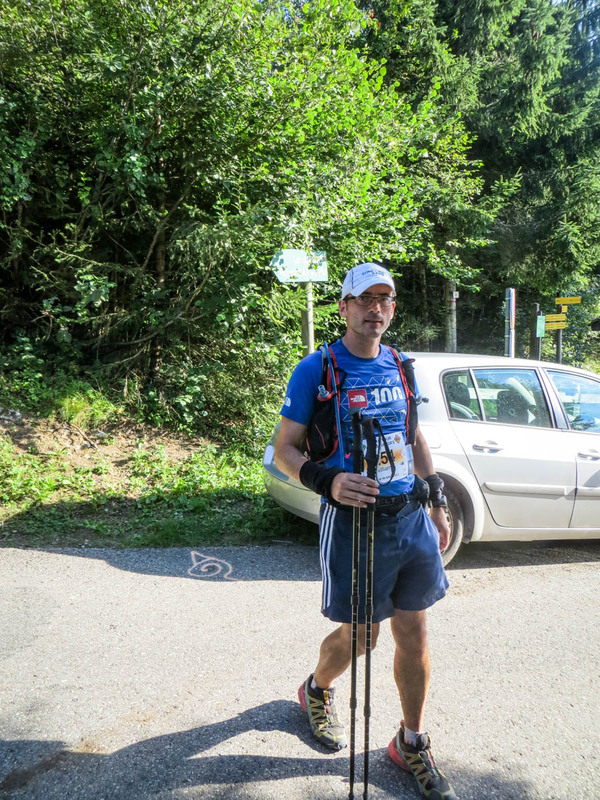 After that there was lots of uncertainty about where I’d be and when due to course changes, to see me briefly at two checkpoints and then hang around at the end for an unknown period of time until I finished! After driving me to the pub the next day for some important post-race debriefs with some great friends, she then had to put up with my inability to do very much at all the next day (due to legs still not really working). And that was after months of me training, building up to 10+ hours a week. A huge thanks to Peta for supporting my running ambitions, both in every day life and through being support crew. I enjoyed reading all the messages of support sent during the race afterwards. Peta did tell me during the race that there were lots of encouragement and best wishes, thank you to those of you who wrote messages in support! I don’t really have any big plans now, even three seven weeks on. I’m hoping to gain some speed for some shorter distance PRs, but my ultra calendar is bare for the rest of 2017, and I have no idea what I’ll be able to achieve in 2018. The day after I was saying I’d never do UTA again, not because I hated it but because I felt I’d done as well as I could after six solid months of training, and I really don’t feel like putting myself through it again. And there are so many other big exciting races that I can spend my running event budget on, I really don’t foresee a return to UTA for a few years. But it’ll always be a special event for me, and I’m sure I’ll have FOMO every year I don’t do it, keeping track of the friends that do! It’s always interesting to look at Strava and work out what you’ve done when. The Training Log and Training Calendar are good, but if you want to see how much vert you’ve done in the last month or what you’ve done in the last 12 months, it’s a bit more difficult to see. I’ve had some scripts that download my data from Strava, and then perform some rudimentary summaries, such as see distance, duration and elevation for every month, or last year. I’ve finally put it online, along with some details on calculating your Eddington Number. It does rely on setting up an API key in Strava, and having a working python implementation - neither of those are insurmountable for the averagely technical person with their own computer. That should increase to 34 and 25 after the weekend. Day one started well — we’d worked out the tram system the day before and so got to the start line in plenty of time. We spent some of that time taking photographs and saying our farewells, and I was definitely feeling relaxed and ready to go. The first 5km were very flat and a good time to warm up the legs and get into a nice easy rhythm, ready for the forthcoming ascents. Ascending St Nizier du Moucherotte seemed relatively straightforward. All of the time I kept thinking of the training runs I’d done that were much harder (even if not of the same length). So my ascents of Kokoda track in Mt Coot-tha, or Chainsaw on Camp Mountain, any of the 30% grade breaks I’d done all gave me plenty of mental comparison with things that I’d achieved. 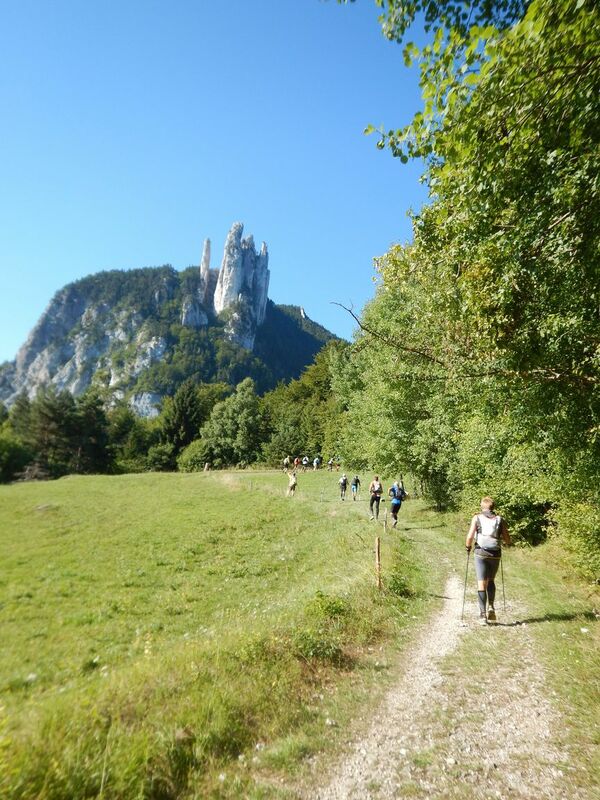 One of my comparison points is of ascents of Camp Mountain (so a 1000m climb is like doing 5 Camp Mountain ascents) and that worked well for the first 40km. The St Nizier du Moucherotte checkpoint was at the top of a ski jump, and I have great admiration for anyone who does the jump and then climbs the stairs back to the top with skis — those stairs were very steep and seemed to go on for a very long time! 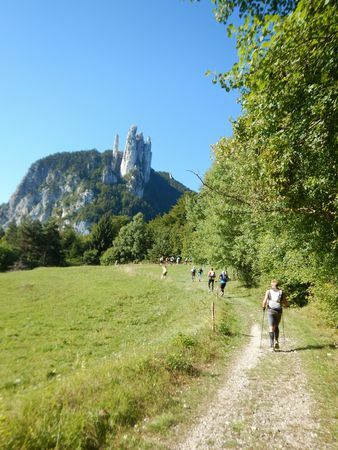 From St Nizier to the top of Moucherotte itself was another 600m of ascent in quite spectacular scenery. Watching the trails of people on the ascent winding their way to the top was quite awe inspiring, and it was good to reach the top. The first couple of kms of descent weren’t much fun (lots of loose rock) but I enjoyed the rest of the run down to Lans-en-Vercors for my first checkpoint with support crew. Peta and Paul did a great job of sorting me out by topping up bottles and making sure I was ok.
From Lans-en-Vercors was the walk up to Pic St. Michel, and then the descent into St. Paul de Varces. I don’t really remember too much about this bit other than the stop at St Paul de Varces, where there was a fountain with fresh cold spring water, so a great place to drench my hat, fill my bottles and have a refreshing cool drink. 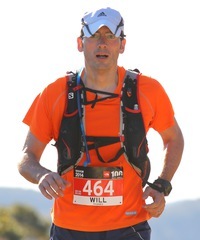 I’m not really sure how I forgot a 1500m descent but clearly things weren’t too painful at that point. 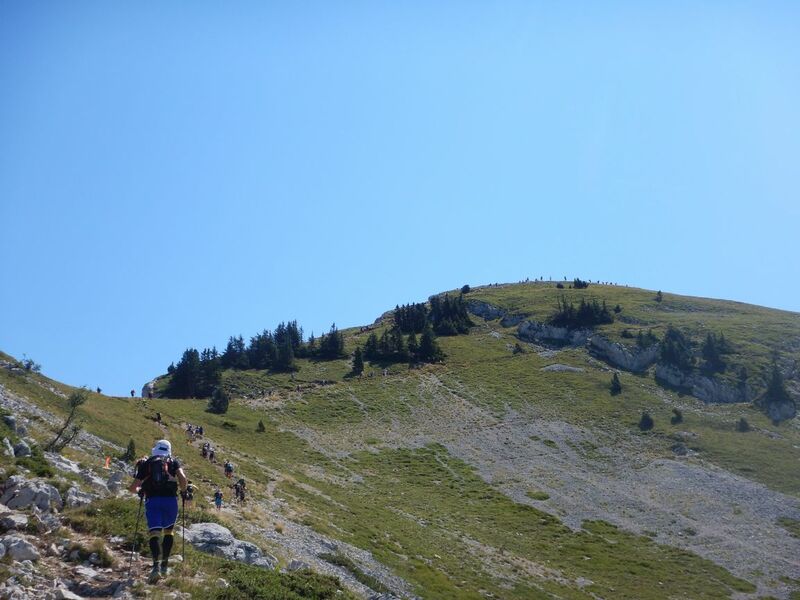 There was a lot of relying on poles to manage the descent, whether using them to hop over obstacles or push myself around corners, but Looking at the timings, the descent wasn’t very runnable (11:00/km for 200m descent is pretty slow!) so I obviously had to take some care. There was a small hill (Montagne d’Uriol) between St Paul de Varces and Vif but it wasn’t significant in itself and then there was the downhill to Vif, which was actually quite pleasant (one of the few enjoyable downhill sections). On arriving at Vif it was great to see Peta and Paul, and judging from the photos I looked a right state in the heat, but between us all we managed to sort out my feet and hydration. 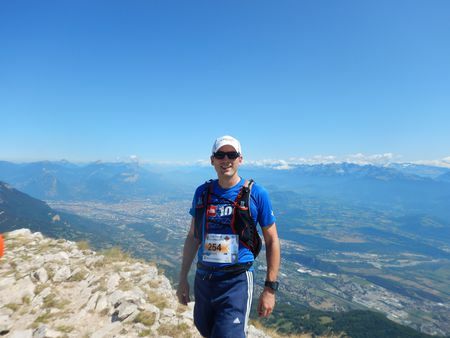 Were I doing the UT4M Vercors 40, I could have stopped here, and perhaps been very happy. From Vif the trail went up 100m to the level of the train line above the town and then back down to cross the Drac, where Peta and Paul passed me in the car and shouted encouragement. Then it was over Col de la Chai, via the village of Saint-Georges-de-Commiers. That village had a lovely water trough with a push button tap — so fresh cool water on demand. 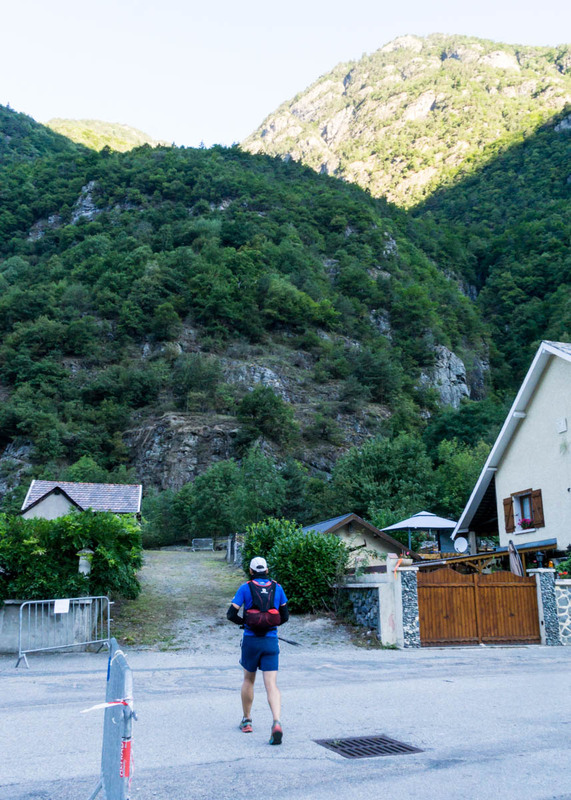 One of the defining monents of the climb to Col de la Chai was the stop at another water trough, where everyone stopped to wet their hats and cool their heads and top up their supplies. I’ve never seen a race where cool water was such a premium and so useful at the same time (the temperature was around 29°C so this isn’t too surprising)! From Col de la Chai it was a relatively straightforward and pleasant descent to Laffrey. From Laffrey we went over Grande Cuche and down to La Morte. The descent to La Morte was that it was nominally a 166m descent, but just before we got to La Morte there was a 100m climb. This was unexpected and annoying but the final descent into the village was enjoyable. We had mandatory kit check at La Morte, which only got annoying when they started checking for different things to what the sign said at the station. Again Peta and Paul were heroes, and provided me with hot stew, it was nice to have some actual food (Tailwind works really well but can get a bit samey). They provided me with all the things I needed for the planned next five hours. I switched from cap to headlamp, and also put on the arm warmers. I was an hour behind schedule at this point but that was fine (and given 100m of extra ascent and descent adds another 9 minutes to my schedule, it’s easy to see how that kind of thing adds up). From La Morte was perhaps one of the most difficult climbs of the day, up Pas de la Vache, nearly 900m of ascent. By this time it was dark and I could sometimes see the lights far above me. It looked pretty difficult, to say the least, the lights were so high! As always, one foot in front of the other, again and again, for 4km. In addition to the usual reflective tape there were occasionally burning logs or flaming torches (can’t imagine that getting signed off in Australia!). In the end the climb took 1h45, which wasn’t too much slower than predicted. At the top it was a lot cooler, and the arm warmers and even waterproof jacket came in useful at various points from here on in. Unfortunately my watch ran out of battery shortly after Pas de la Vache, so I don’t really have a clear idea where the time went compared to schedule, but I arrived at Lac du Poursollet at 00:30 and I recall not really enjoying the descent too much. One of the people at the aid station saw the Australian flag on my race number and said “Oh, an actual Australian, they’ll be so excited to have you, not a fake Australian like me” — so I explained that I was no more Australian than him! He helped me with my bottles and told me where I was in relation to cutoffs (7 hours buffer) and told me that the descent to Riouperoux was very hard and that I should take care and take it slowly. My final section for the day was down to Riouperoux — 5km of descent down rocky, slippery, screey switchbacks. I didn’t feel able to run almost any of this section, and on one of the times I did try running my left foot slipped off the path and I somehow tumbled onto my front, bashing my left thumb against my walking pole, hitting my face on the ground. My right knee felt a little niggly as a result but it could have been a lot worse. The biggest knock was probably to my confidence which was already pretty bad on the descents. For a lot of the descent I could see the lights of Riouperoux in the far distance below and it just felt like it took a really long time — even when we got to the road at the bottom of the hill, it must have been another km to the checkpoint! I was so glad to reach the checkpoint. By now my phone had run out of battery too, I had a portable charger in my drop bag (but no phone cable). I had a look around all the laptops in the checkpoint and saw one that had a sign “Laptop not for public use” but also a cable coming out of it that fit my phone. So I used the cable to charge my phone next to the laptop (so that whoever’s laptop it was knew I wasn’t stealing the cable) and charged it enough to send some texts to Peta to let her know to come to Riouperoux the next morning as I wasn’t sure at this stage that I wanted to continue but wanted to talk to her first before any final decision. I then bunked down on the floor of the rest room to grab three hours sleep, having put on my fleece and long trousers to keep warm, and even then wrapping myself in the blanket. Less than three weeks until the big day. Less than a week until we leave Australia for the UK en route to France. Pretty exciting times. We have our train tickets sorted for the trip from London to Grenoble, a hire car and accommodation through AirBnB. As the running has been tapering down (particularly with some chesty cold thing I’ve had the last two weeks where running hasn’t felt like the most sensible of options) I’ve been ramping up the preparations for the race itself. 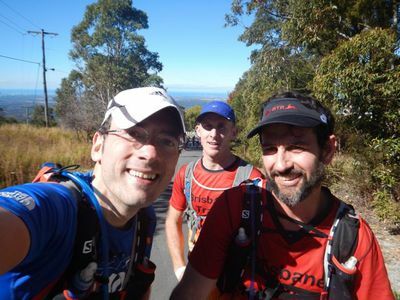 I’ve also put in some good walking efforts, with 8 hours on the Gold Coast Hinterland Great Walk last weekend. 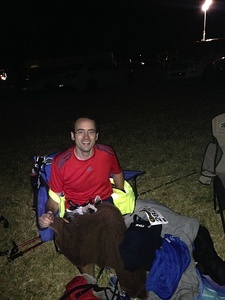 I now have a good idea of my planned checkpoint stops — where I’m planning to sleep (yes, this is the first race I’ve ever done where I’ve planned a nap), where I’m planning to have a main meal and where I’ll be refilling my bottles. I’ve checked the mandatory kit, and thankfully I have everything I need, and it’s all ready for packing. Other than the last couple of weeks where I haven’t felt 100%, my training has been going well. I managed a training record week of over 110km (I have run further in a week, but only in weeks containing a 100km race), I did over 10000m of ascent in July (so as much ascent in a month as I plan to do in a race). There’s always more that could be done, but I’m just glad that my knees have survived the training (they’re feeling better than they have in months after a gentler week). 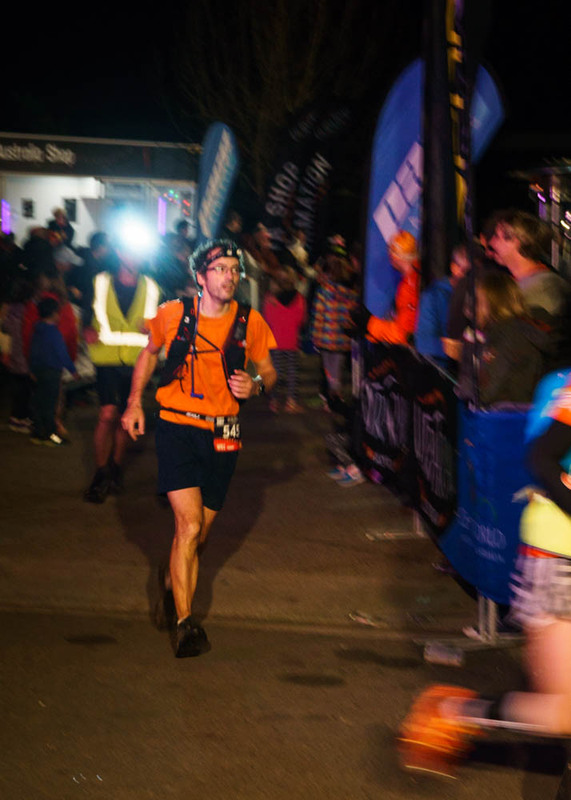 I’ve missed some race reports (Nerang 50km, Camp Mountain Ultra — ok, I was sole participant in that one) but I’ve been struggling to write anything down other than the odd Facebook update and run description on Strava. Perhaps I should reentitle this ‘A runner’s apology’ — but hopefully my race performance will reflect the effort I’ve put in. Race checkpoints spreadsheet — heavily adapted from the French original but with minimal translation. I’ve broken it down into theoretically supportable refreshment stops (just the name in green), planned supported checkpoints (row in green) and major stops (dark rows). Refreshment stops in red are unreachable by car. Other rows seem to exist for timing predictions (usually a change of gradient direction). I probably spend nearly as much time reading running books as I do actually running. Some books are biographies, some are training manuals, almost all are inspirational in their own way. I’ve read quite a few Ultra specific training books, but most of the included training plans seem to be way beyond how far I want to push things. I’ve read some great books about how to come up with some decent training plans tailored for yourself (basically anything by Greg McMillan or Matt Fitzgerald is likely to be good). The book that’s had the most influence on my training is Matt Fitzgerald’s 80/20 Running, which has really helped to to think about how I can run more while not breaking myself. By ensuring that most of my runs are low intensity (recovery runs, easy runs, long runs) with just some high intensity work (hill training, tempo sessions etc) it seems that I can indeed run for longer each week than I previously thought possible. Obviously I’m hoping to avoid any training niggles. Adharanand Finn’s The Way of the Runner about running in Japan was a fascinating insight into Japan’s running culture (I also really enjoyed his Running with the Kenyans). More importantly, however, he talked about how he’d learned more about functional running and ensuring that the body is sufficiently strong, flexible and balanced to run. And that led me to the book he mentions, Kelly Starrett’s Ready to Run. I already had some strength training in my training plan but this book inspired me to tweak those sessions to include more flexibility and balance work. I’m currently doing four runs a week with two strength/flexibility sessions. Every month or so I’ll do a back to back weekend and run both days. My ultimate goal is to be able to do two 55km days in a row, as that should be a good test that I’m ready to do 165km in a single session. I still feel a bit of a way off my peak (I hope so at least!) but some of it might be the very long summer - I certainly do better when it’s cooler. Today I did an out and back that was supposed to be 30 mins out, 30 mins back but I just ran out of energy for the return and it ended up taking me 34 minutes. Here’s my UT4M training plan. Some of the later sessions might be a little overambitious (although given that 45km with 2500m elevation takes me 6h40, maybe a few 7 hour sessions won’t do any harm). Getting my recovery right is probably the key. I took an easier week last week and yet I still don’t feel like I’m getting any stronger, so I need to keep an eye on that. 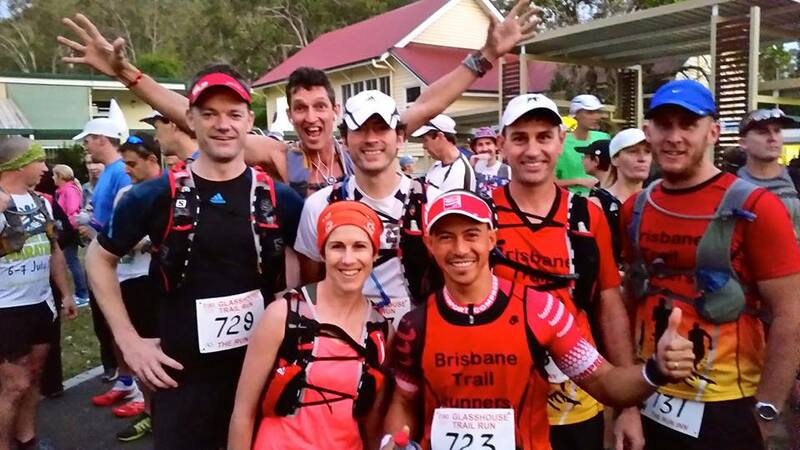 2015 started well with some great weeks on the trails in January and early February, with Mount Glorious race recces, a very wet Mount Coot-tha run, the Brisbane Trail Running Series race at Bunyaville and more. Unfortunately my running took a two week hiatus just while I was hitting my stride as I somehow cricked my neck in my sleep, and then made it worse the following evening by going trail running up Chainsaw. By the end of that run I could barely move my neck. Several physio trips later and a couple of weeks off running and it finally eased up ready for more running. 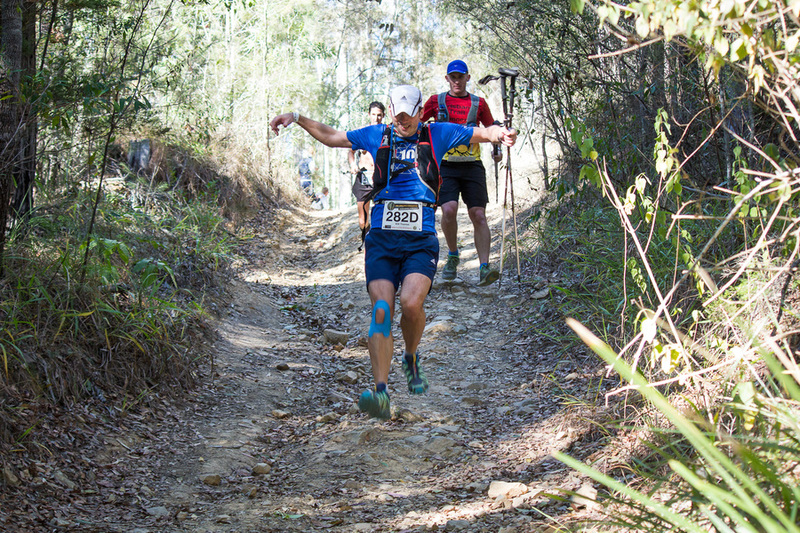 The postponement of the Mount Glorious race was ideal for me — I was marginal for the original date as I was only just getting back into running but two weeks later and I was ready to go, and got a 3 minute PB. 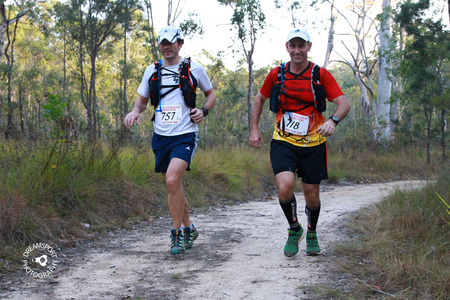 I went to Mapleton for the Sunshine Coast Hinterland Great Walk run, 32 hard kms up some very long climbs, but was good to be able to run with Brad again who had just come back from injury and did very well to finish the 32km. 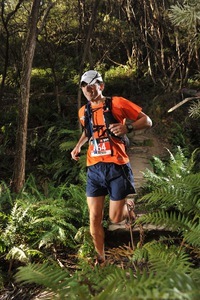 The following weekend looked like it might be another good one as I was in good form for the Twilight Half. Alas, it was not to be, as torrential downpours flooded the course and a severe thunderstorm loomed ominously enough for the race organisers to stop the race before the second lap. I found out it was a 10km race at the 9km mark, and the last km is my third ever fastest according to Strava. I was a minute off my 10km PB, and well on course to beat my half marathon PB by around three minutes. The conditions were ideal for me other than the flooding! 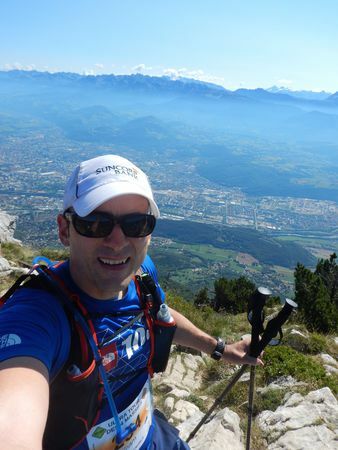 My Ultra Trail de 4 Massifs training plan remains on track — I’ve only missed one planned run so far and I’m comfortable with how I’m doing. My two biggest sessions have been a back to back weekend containing Pinnacles race recce followed by 26km at Mount Coot-tha, and yesterday’s Numinbah to Pollys 50km race, of which more to come. I’ll also provide more details on my training plan in a future post. 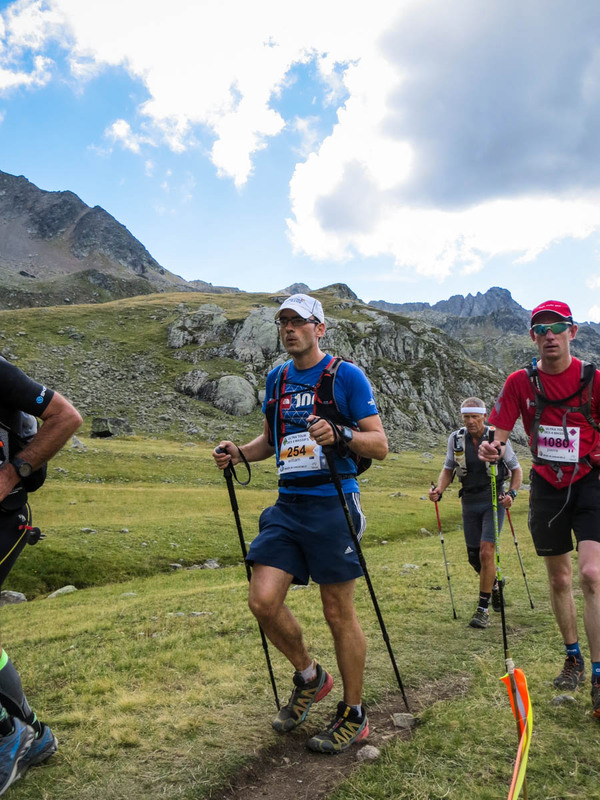 Although it’s a few weeks late for writing a review of the previous year, the announcement of Ultra Trail du Mont Blanc places also makes it quite timely. 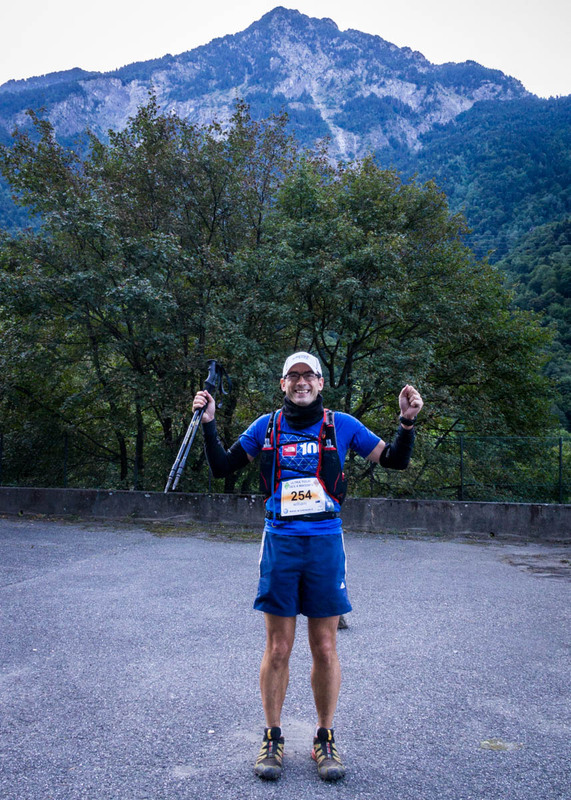 2014 really was all about qualifying for the UTMB. They announced early in the year that the qualifying points had been raised from 7 to 8. And it’s always been from three races. 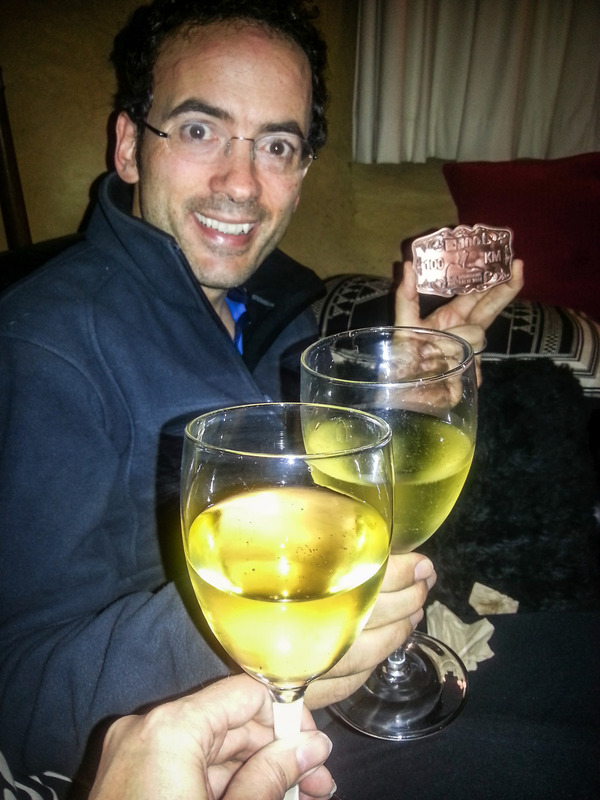 With my point from TNF 50 in 2013, I could have just(?) done two three-pointers to qualify, but the increased point meant I’d need to do a four-pointer or just do an additional two-pointer. Things went well enough in that regard - I felt I did myself justice in the North Face 100 given how unwell I was for the previous 10 days (I wasn’t that sure that I wouldn’t give up after 5km but I was feeling good so carried on). After that a friend’s bad luck turned into my luck as a Kokoda place fell into my lap. 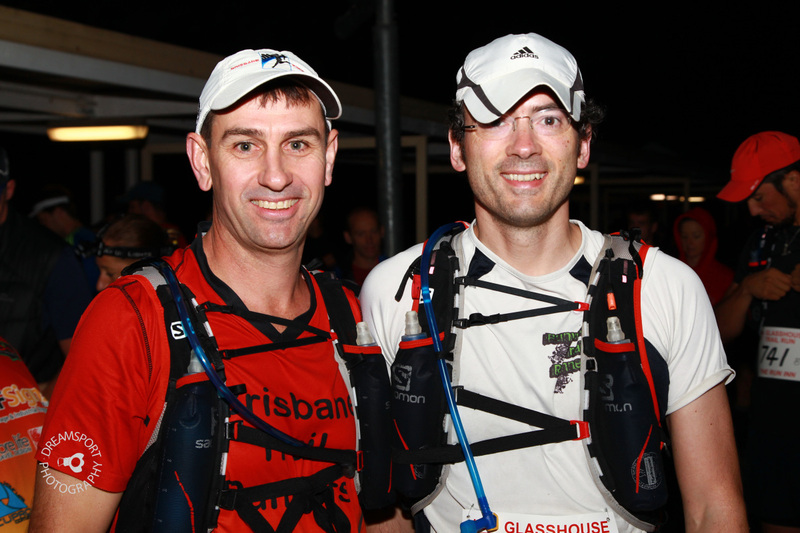 And then I finished it off with the Glasshouse 100km for the final two points. 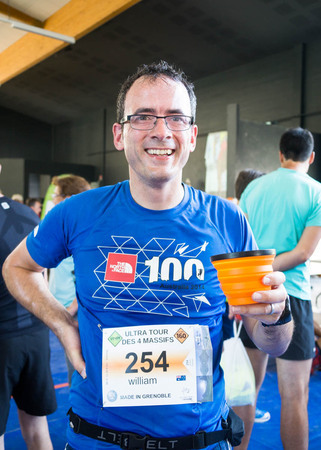 My first 100km run. And second. And third. A 14km race that was faster per km than my 10km PB. Worst cold in years prior to the North Face 100 - no running in the previous 10 days and I wasn’t sure how my chest would affect my race. It might not have done too much harm. Calf strain following Sandgate Sunset run meant I didn’t run most for much of a month. With Ultra Trail du Mont Blanc not an option this year, I’ll concentrate on remaining qualified and enjoying running and racing with friends. I’d like to continue to increase my elevation - less kms but more vertical gain is perfectly acceptable. With that in mind I’m likely to do more trail races and fewer road races (for example Nerang 50km and Twilight Half clash this year, so I’ll probably do the former). Writing this has helped to ensure that everything is in the right place for tomorrow. One could probably argue I carry too much stuff, but I like to be safe and prepared, and relatively self-sufficient. Tomorrow will be my first experience with dropbags, so I’ve tried to ensure stuff will be in the right place. Even writing this I realised that my understanding of where the checkpoints wasn’t quite right (I thought that 4 and 7 were one-third and two-thirds around the course, rather than one-quarter and three-quarters), so I’ve just added a second drop bag for checkpoint 8, that I’ll now have to go and pack. My expectations for this race were reasonable but not amazing. I had high hopes of getting a personal best, but also knew that it wasn’t a given. The conditions in 2012 were great, and my training was very marathon focused. 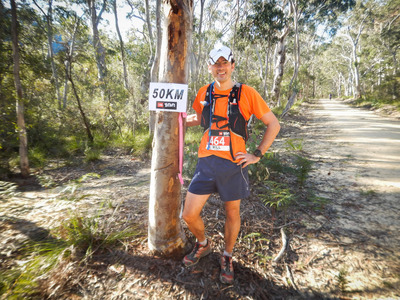 This year my training has been for 100km trail races, and it’s only 2 weeks since I spent over 20 hours on a properly tough course. But I did well at City 2 South not that long after the North Face 100, and marathon predictions from that result suggest I’m capable of around 3:20. Being capable and achieving it are two different things! And then there’s my knee — it can cope with running, but would it hold out for the full 42.2km? My alarm went off at 03:45 this morning. Because I wanted to have coffee and breakfast and not leave it too late to get to my pre-booked parking ($5 is a bargain, but the roads close at 05:15), plus leave time for congestion, the goal was to leave home at 04:15. Peta wanted a lift to Shorncliffe Pier for some dawn photography, so by the time I left Sandgate it was 04:25. But with almost zero traffic until 100m from my car park, there wasn’t much to worry about, and I was heading for the bag drop by 05:00. While driving in I had some energy drink, as last year I really suffered from low energy at around the 25km mark. By Brisbane standards, this morning was pretty cool (8°C) — I definitely appreciated wearing long sleeves and long legs over my race gear. 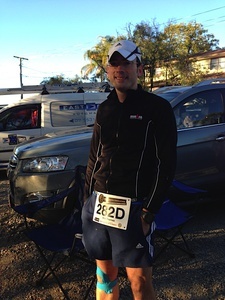 By 05:30 I was feeling warm enough to get out of the outer layers, put on my race number (which because it was transferred late, said “David”), apply sufficient anti-chafing strategies and sunscreen and drop off my bag. On the way to the start I bumped into Dean and Vanessa who run Sandgate Parkrun. I’d picked up their race kits the previous day as they were busy filming Sesame Street (how cool is that?) so stopped to say hello and see how they were feeling. By the time we were heading to the start it was 05:50. My starting zone was full. Properly full. In the end I managed to squeeze into the very rear of the zone, but in hindsight, I should have just gone forward a zone and tried to go backwards to the start of my zone. I really wanted to avoid the bottleneck at Story Bridge, which meant getting a good start for the first 3km, but it wasn’t to be. In the end I just went with the flow (I think a similar thing happened in 2012, and I got a PB then), and settled into a pace that was a little slower than I’d have liked but at that stage of the race there’s no point going off too fast. I had a great run. Once I got past the bottlenecks I was running 4:45/km pace for a lot of the first half. 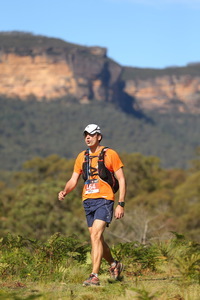 My goal was to limit my exertion so that I would feel strong at the 32km point when I think the marathon really starts. Conditions were almost ideal: cool, slightly overcast, slight breeze (ok, quite windy at times, but never too bad). I tried to avoid the mistakes of the previous year when I sprinted down the Go Between Bridge and then started to blow up shortly after. 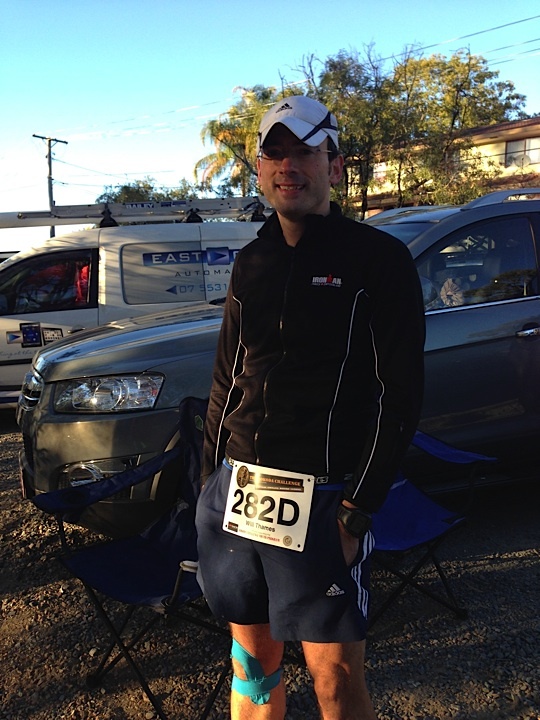 Or when I ran out of energy at the 25km point because I’d had nothing since breakfast. And then borrowed a gel and then had stomach issues. While running around, many of the crowd were cheering “Go David”. I’m a big believer in the power of crowd support (only when things are going well — when things are going terribly, people telling you “You can do it”, “It’s not that far” aren’t providing as much benefit as they might hope) and so I always like to acknowledge the support. So I just waved and thanked people who called me David (or Dave). Whenever I heard “Go Will” was always a pleasant surprise, but there were a few people running or supporting who actually knew me! As an aside, while I believe that people are only allowed to say “Not far to go” in the last km or two, the person who told me at 300m to go that it was only 2km to go was no more helpful. I knew how much I had left as this was my third time but had I been a new runner to the course I’d have got quite disheartened! By about the 30km point, when I had 12km left to go, I thought that anything quicker than 5:00/km would take that amount off a 3:25 finish, so I was hoping for around 3:23 at this point, if I could maintain 4:50/km for the remainder of the race. I must have got my calculations wrong because I didn’t go much slower than 4:55/km — perhaps I’d forgotten the final 200m. Sums are hard when you’re running! The last 6km were particularly tough, after I’d crossed the river at the Go Between Bridge again, and headed on the out and back to Toowong. The temperature was rising and there is no shade. My knee wasn’t too bad but I wonder if my gait was slightly out of alignment as I could feel tightness in my hips. In the end I just carried on, trying to maintain as much pace as possible. I dropped below 5:00/km once in the race, but once I got to the 41km mark I knew I had about six minutes left and upped the tempo, which felt great. Why didn’t I do that earlier! I finished in 3:25:11, a PB by just under 5 minutes (my previous PB was 3:30:07). I’m definitely happy with that. I do believe I’m capable of going faster if the marathon was my key race, rather than doing it on the back of 100km training. Also, there are conditions that would suit me better, such as if it had stayed cooler during the day, but those conditions don’t really happen very often in Queensland! I didn’t quite make the top 10% but I was 62 out of 515. Full splits and results for me. Oh, and you know you’re an ultrarunner when someone asks you “so tomorrow’s race is 100km?” and you reply “oh no, it’s only 42km”. Note: this post has taken nearly two weeks to complete and so there are some lapses of memory. Apologies if I skipped anything important! This is another of my posts that likely requires a cup of tea. 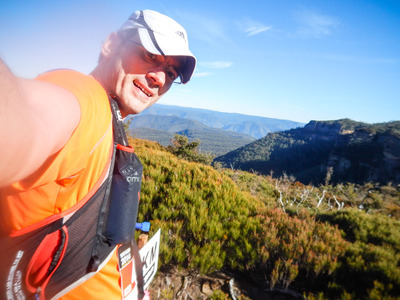 My journey to the Kokoda Challenge and beyond was a rocky one for many of those involved. 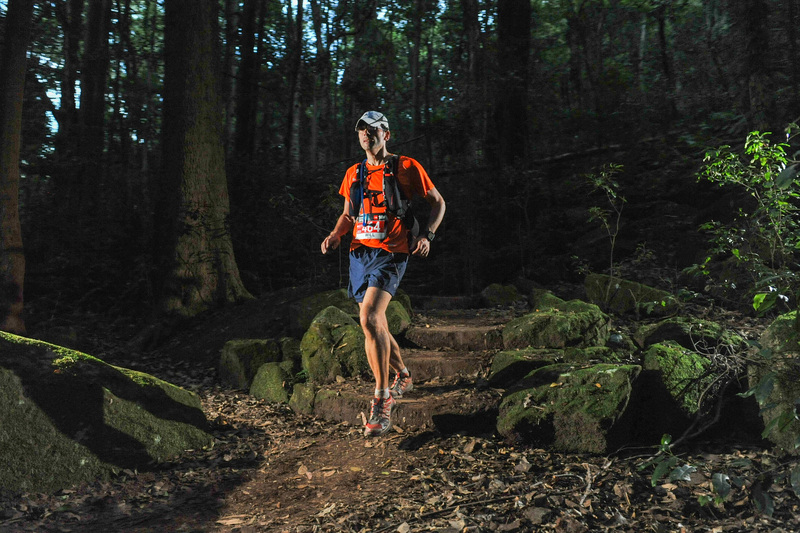 For those who don’t know, the Kokoda Challenge is a 96km trail walk or run in the Gold Coast hinterlands, where teams of four attempt to get from one end to the other, taking in 5000m of vertical ascent over the course. You can’t start with less than four people, and if two team members drop out, you need to join up with another pair before you’re allowed to continue. I’d had discussions about joining a team early this year, but as the North Face was my primary goal race for the year, I wanted to make no commitments beyond that. Other teams were formed and I had good fun running with Aaron and Brad — they were doing their Kokoda training and I was doing my North Face training. Unfortunately at the same time I did TNF, Aaron developed a very nasty knee problem that prevented him running for weeks. While thankfully he’s slowly easing back into running he had to withdraw, and I was the logical substitute — I was trained for the distance (I’d eased off a little after TNF but otherwise fighting fit) and keen to join the team. Over the last few weeks of training, I too managed to pick up a knee niggle. I took a few days off running and went to see a physio, who told me that it would be tough even with a good knee, but that he’d strap it, recommend some rolling and stretching exercises, and I could go back to running. He suggested I might want my strapping changed before the race, but as I could barely get up the step onto the train when the strapping was first on as it was so tight, I figured I’d just keep the strapping I had. So, I was strapped, trained, prepared for the course and ready to go. And at 5pm on the day before the race, they changed the course. 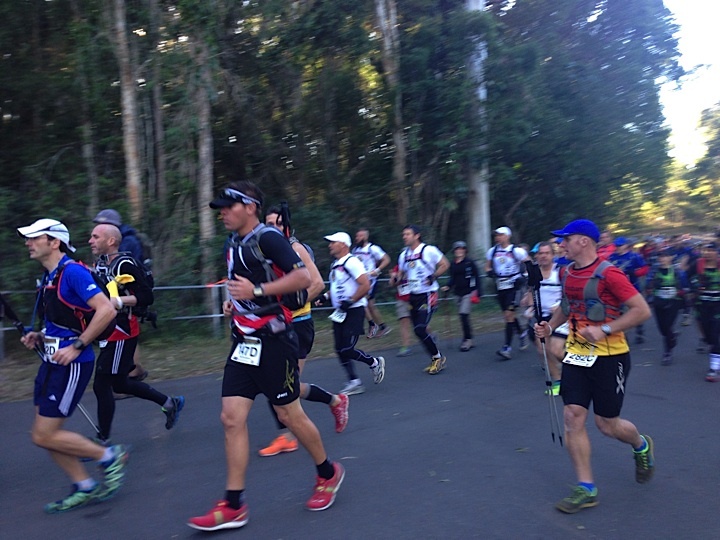 Rather than a nice gentle 20km followed by some tough hills and then a really tough last 50km, we were to do the last 50km as an out and back. Double trouble. Additionally, the route change added an extra 3km to make it 99km in total. Due to a bush fire on the route we were taking, the organisers nearly had to cancel the race — apparently at 3pm on the day before the race, there was no race. By 5pm they had worked with the Rural Fire Service, police, State Emergency Service to agree on a safe course. Some frantic rescheduling of pickup times occurred, but by 9pm I was fully packed, prepared, and ready for bed, at which point I had a great sleep until about 2:30am (before a 4:10am alarm call) and then tossed and turned trying to get to the right temperature and having vivid dreams that it was 7am and I’d completley missed the start (yeah, the usual pre-race jitters). When the alarm actually went off, I quickly put on all my warm clothes, had coffee, breakfast, and was ready when Shayne arrived at 4:45 as planned. 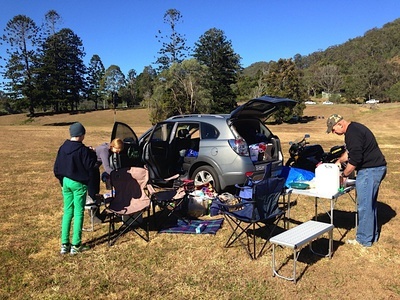 A quick trip to pick up Kerno and Brad and then we were off to Nerang velodrome for the new race start. We passed the time for the next couple of hours sorting various bits out — race registration, slowly getting out of warm clothes into the starting kit, chatting to fellow runners — it was early but it didn’t drag too badly, and we were soon ready to head to the start, after a few photo opportunities (including one where I was the only 1 of 12 across the three Brisbane Trail Runner teams not wearing a BTR top). 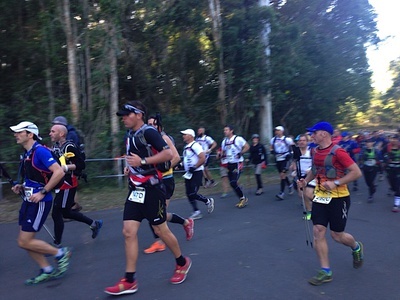 The start itself was preceded by an explanation of the previous day’s events leading to the near cancellation of the race, and also stories from veterans of the Kokoda track defence — reminding us that no matter how bad it got, at least no-one was in danger of being shot at. After a minute’s silence and the Last Post, the school teams doing the full course set off. A couple of minutes after that we were off too! We took it nice and steady for the first few kms, taking in the terrain as it slowly rose. We passed and were passed by other teams as the pecking order slowly established itself. 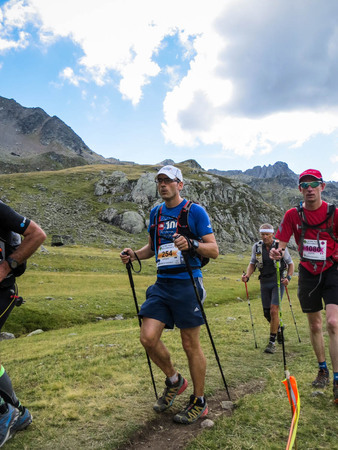 There were some groups with some annoyingly loud people that because of how little pace varies uphill, stayed close to us for longer than I’d have liked — I took off at one point picking up the pace a little too much — the team followed but at that stage it was a little unnecessary. At the top of a descent Phil stopped — I thought he’d take a quick break and I’d carry on, but by the bottom of the hill I realised he wasn’t behind me. After a while I realised I should go back to find him. I passed a few groups who let me know he was on his way (so at least I didn’t have to go back up the hill) but it was a while until Phil reappeared. His water bladder had broken and he was unable to get water out of it but had come up with a solution. We carried on together to the first checkpoint where Loz and Brad had already checked in — we must have been five minutes later checking in which didn’t go down too well given you’re not supposed to be more than 100m apart. We pushed on and here our first problems started. At the 10km point, a pink ribbon was missed. As a team we bear collective responsibility for the following 3km when we ran without seeing another pink ribbon (to my shame I didn’t even notice — I was merrily following along like a sheep). At this point Phil mentioned to me that he hadn’t seen a ribbon for a while and we bumped into some trail bikers who hadn’t seen anyone else. We were just about to ascend one of the steeper hills of the Nerang course and thankfully avoided going any further. We headed back, collecting all the other teams who’d blindly followed us and got back to the 10km point — an additional 6km! We were all fuming at this point — we had so many team lapses — some people had spotted the ribbon but thought it must be for the way back, some people were too far ahead to even discuss this with, and some people hadn’t even noticed the lack of ribbons. It took me a good 15km from here before I stopped being annoyed with myself. At this point we’d done 16km and were now behind people who had done around 10km, and so we had to overtake those people all over again. Thankfully most people were fairly gracious about this (there were probably a lot of people wondering where all these fast people suddenly came from). After the first checkpoint came the first monster hill up to Beechmont plateau. 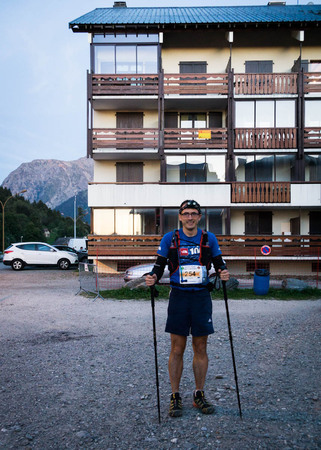 Like a lot of the hills in this race, it really was just a matter of putting one pole in front of another (I was so grateful for my poles — I used them for the whole 100+km) and following that with one foot and then another. We bumped into our Brisbane Trail Runner compatriots from the other team. Kerno was really suffering — he’d had massive cramps and fallen over as a result, and was just struggling to keep moving upward. But he did, slowly but surely. We got out of the worst of the hill onto the road, where we expected Loz to be waiting for us (he’d long since left us for dust) but we didn’t see him until we actually summitted the hill. Phil was struggling with downhills by this point, but here at least we had some flats and the downhills we did have were gentle, so were able to put in some runs for a while before we got to Syd Duncan Park and took some more refreshments on board. From Syd Duncan it was a long, slow descent into army land. 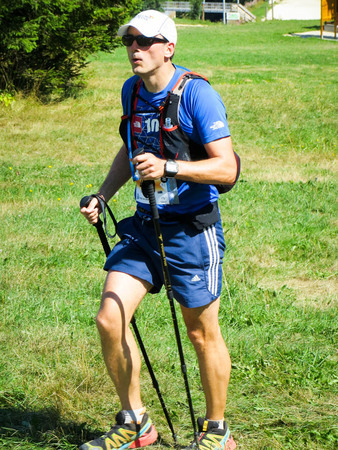 It was dusty, loose, rocky and at one point I was attempting to use my poles as if skiing down the slope because running wasn’t much use. Because Phil was struggling down hill, and I was wary of descending too fast and further inflaming my knee tendons, we were actually descending slower than we were ascending! Once into army land it was pretty cushy — the creek crossings were very easy — while it was possible to get wet feet if not careful, you could walk through most of the creeks that weren’t dry and the water wouldn’t go above the sole of the shoe. At the 40km point we got to the army land checkpoint (Three Ways) where they kindly pointed out to us it was only 5km to the next checkpoint. I’d seen the profile though. So, 5km, uphill. Again, another long uphill trudge. No real dramas, we were all capable of good speed uphill, catching up with and overtaking other groups. It was here that we first saw the 48km Jim Stillman cup participants who at this point had got to their 15km point. As we got further uphill, we were struggling to acknowledge and reciprocate every ‘Well done’, ‘You’re doing well’ but we did try our best — certainly I wouldn’t have contemplated doing a 48km run or even unbroken walk at that age. Brad, Phil and I took it in turns to lead the uphill stroll and thus be in charge of greetings acknowledgement! Shortly after the top of the hill, it plateaued and then a couple of gentle kms and we were at the official 38km checkpoint. We picked up lights, a bit more cooler weather gear, had some minor snacks and minor first aid (not me this time — the blister plasters I put on at 24km lasted the remaining 82km). From this checkpoint it was a couple of kms across fields and muddy bog and then it was down, down and down. We passed some very tired looking teams — two of a group of teenage girls seemed to have given up at this point. They were actually very near the top, relative to the rest of the climb, but I didn’t realise just how much down we had still to go. From a profile point of view, it was obvious — we had to lose 500m of altitude but what that translates into in reality can be quite shocking. Steep dusty slope followed steep dusty slope — because we weren’t running downhill any more we just took our time, and I used my poles for balance, or to push me around corners, or to take load off my legs, anything to make it slightly easier to descend. Finally at the bottom it was an easy run across the bridge over the Nerang River and then to the next checkpoint at Numinbah Environment Centre. We didn’t stop here long — check in and then onwards. Uphill and then downhill, pretty unmemorable now, until finally we got to the pipes that took us under the road to Numinbah Hall. Here we did stop a while — Phil got a very effective looking massage, I fully topped up with water (and drank a couple of cups, realising quite how thirsty I was). 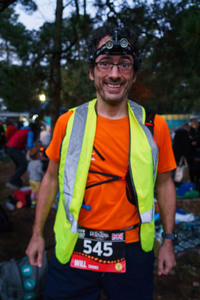 Also had a bite of my chocolate chip bar, and put my fluoro top and light on at last, as the sun had already set and it was only going to get darker from here. We were on the return path after 55.5km and 9 hours. As before, the run between the Hall and Environment Centre was pretty unmemorable, other than being awkward for the number of people now coming the other way. I do remember feeling grateful and sorry for the guys manning the road crossings — always cheerful and generous with their support, it’s a long effort for them. Again, we passed through the Environment Centre pretty quickly onto the next section, probably the toughest of the day. 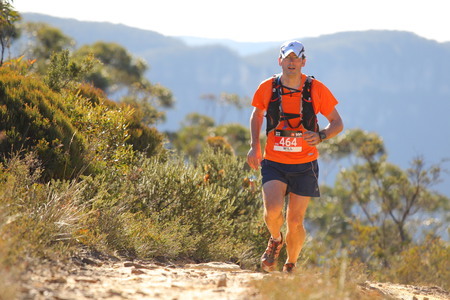 In my mind, the run up to the 60km checkpoint was three Camp Mountains (a run up Camp Mountain takes about quarter of an hour per km and is 200m in ascent, so it’s pretty close). Again, one pole in front of the other, one foot in front of the other, count down the kms. 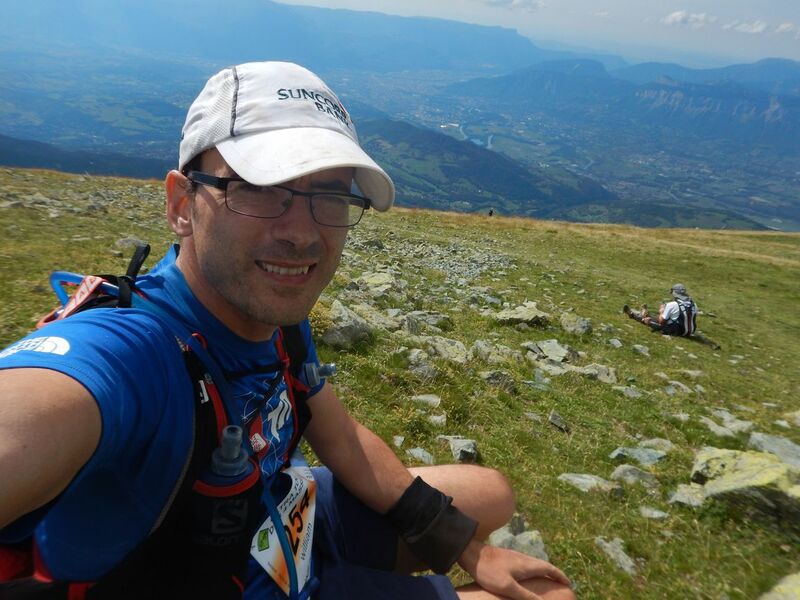 After 2kms, we started to go down, and although I knew there was a kink in the hill, I really started to believe that perhaps we were nearer the top than I thought — after all, it was only 2km to the checkpoint and surely most of that was fields? And then we turned a corner, and saw a string of lights descending a very big hill and realised that was the third Camp Mountain. Although the track was narrow and dusty, we managed to get up it at the same time all those people were coming down, and eventually we got to the top. At the bog bridge, there were so many people coming the other way that in the end Phil just shouted across the bridge to stop and let us through. Graciously the other direction paused as we came through (they really didn’t have any other way of knowing, the traffic was that bad), even apologising for holding us up in our cooler running kit while they were decked out for walking over night. And then it was the trek across the fields again and we were at the checkpoint. Dinner! I had made chicken soup a few weeks before in preparation, and macaroni the night before, and it turns out that chicken soup and macaroni was exactly what I wanted. I also made sure I had all the colder weather gear I was likely to need, as Danica was reporting that the temperature could go down to 1C. I hadn’t brought a spare top but Phil lent me one so that I had a dry one, and also put on my arm warmers. It was at this point that I lost it a little with Loz — he was ready to leave and I was just slowly getting my stuff together to get going and he said something that made me just tell him to shut the f*** up. Apparently Danica was surprised even to hear me swear, but even though me swearing is not that rare, me swearing at people is. I was not feeling 100% happy with Loz. 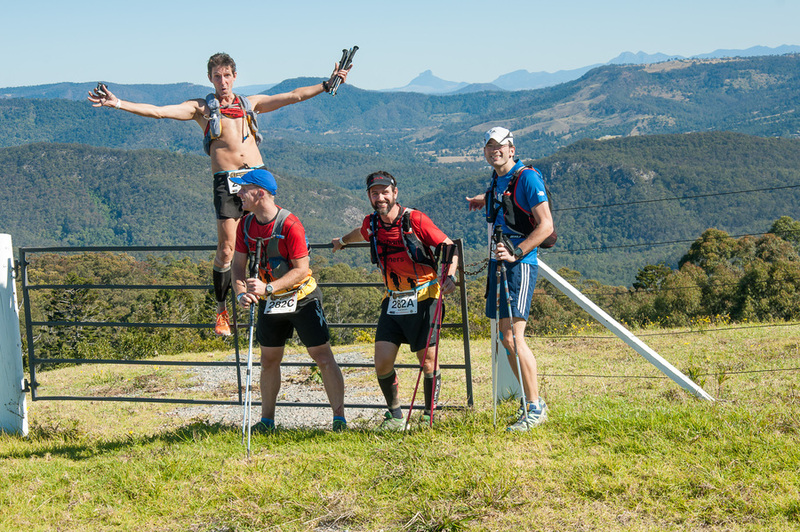 The plateau from the 60km checkpoint was probably the last running we did until the end, as Phil’s knees just weren’t feeling good on the flat or the downhills now (not that there was that much flat to be had). After a couple of kms, my light started to die (after just three hours of use) and we started making the descent into the depths of army land, another seemingly interminable descent. It was at this stage that Loz seemed to have completely lost the plot, shouting into the breeze — wasn’t really doing any harm but I preferred the tranquility of nothingness. Apparently too much cola was to blame! But we got to the Three Ways checkpoint again, and didn’t really stop long (although Loz lent me his spare battery here, which really helped me to not feel blind). Then back across the creek crossings, before the ascent back up to Beechmont Plateau. From here to the end we were much more of a team, sticking together as a four, which made me a lot happier. We were ascending really well (of all the things that we were doing, relative to how you’d expect us to be doing, our ascending was the strongest) and so it was another long upward strong trudge to the top before we returned to Syd Duncan park. At this point I was getting cold from the wind, and so time for my windjacket. I was wondering if I had enough warm clothes but I still had an additional fleece layer if I really needed it, along with a buff, gloves and armwarmers that I was still wearing under my jacket. After Syd Duncan there was the long haul along the roads which felt pretty dull (although slightly helped by some kind supporters handing out Freddos and Caramello Koalas along the way) before the final long descent of the day (there would be further descents, but none anywhere near as long) down from Beechmont to Little Clagiraba. It seemed that we saw the lights of the checkpoint hours before we got there, and the dusty bit of track that traverses the slope was particularly nasty, but we got there in the end. At this checkpoint Geoff from the support crew for the other men’s BTR team told us that the remaining two members of that team were just about to come in. And I got a bit grumpy with him for even mentioning the other team, worrying that it would cause Loz to hurry off so that we could beat them. I am very sorry for being grumpy to Geoff who was just checking if we could go with them if they needed us to make up the numbers (a team of two can’t continue on its own until it has joined with another group). In the end they didn’t need us and beat us to the line by an hour. And then more dinner! After eating I went a bit crazy and put on a few too many warm clothes (something I’d been ribbing Brad for doing earlier on in the day). At the checkpoint I had on my buff to cover my ears and neck, and also put my gloves on. Soon after we took off I was boiling and it was time to remove gloves and arm warmers and I got back to a sensible temperature. One last reasonable size hill to cover and we were back to the 10km point where it had all gone so wrong earlier in the day. From there through the 8km to go checkpoint, up the ludicrously steep hill where Phil had stopped at the top early on, and then up and mostly down for the next 8km. At 18km to go we’d hoped to go sub 20 hours, which was still possible if we could do 6km/h for the next three hours. And I have to say we made a valiant effort — we powered up the hills but just weren’t making the necessary time up on the flats or downhills to quite do sub 20. The final checkpoint at 4km to go was a surprise, as there hadn’t been one on the way out. We checked in and out and they confirmed that we had just 4km left to do. But that still meant nearly an hour of travelling. At the time it felt ridiculous how much hard work we had to do — another hour still! Slowly but surely we got to the end. Tiredness was seeping in (it had gone 4am with 2km to go) and my borrowed light had faded and I was onto my original backup torch. Then we hit 1km to go, and it suddenly started to feel manageable — just five lots of 200m! We kept going, and then we could see the lights and hear the sounds of the velodrome. We kept on walking until with 50m to go I asked if everyone felt able to run across the line. And we did, together. Across the line we were given our souvenirs — a certificate and finishing dog tags. 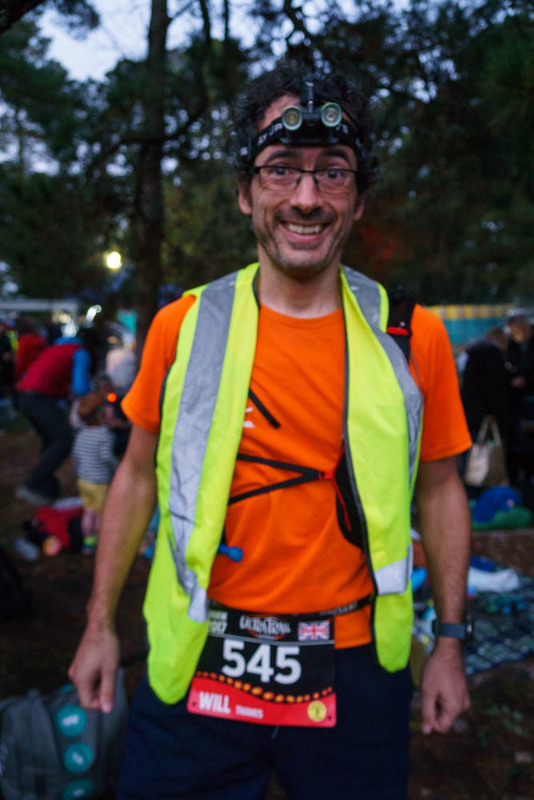 We had our photos taken, and caught up with other friends who’d finished, including new friends like Elmer, a guy I’d never met but had bumped into as our teams crossed paths a few times before they’d gone on to finish in 19:15, a fantastic time. But our team was whole. 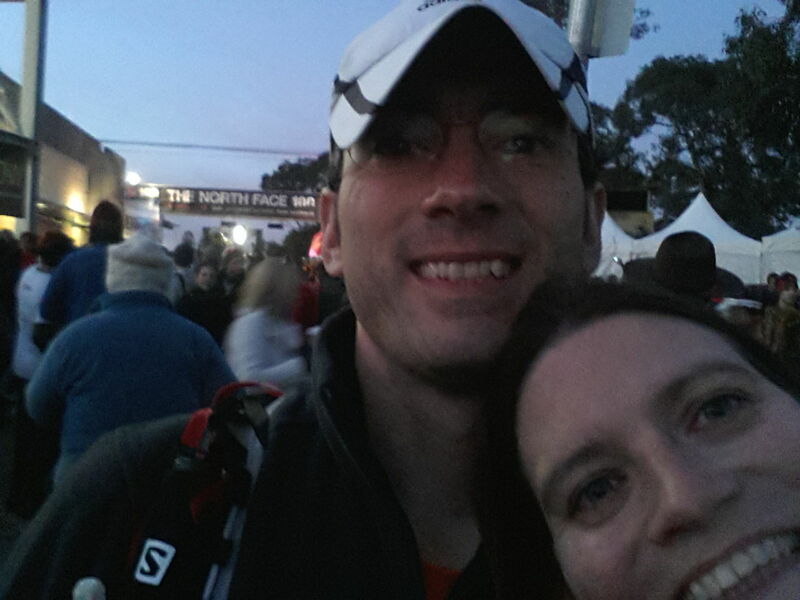 Much as many times during the day I felt like stabbing Loz with a pole, I was happy that we’d finished as a four. We didn’t make our time goals, but adding 6km on to our route hadn’t helped with that either. I was pleased that we’d managed to dig ourselves out of the collective funk associated with going wrong and pressed on. None of us ever mentioned quitting and as far as I know, none of us considered it either. I made some personal stuff ups. I should have been more attentive to our route finding. I should have brought a spare top (I had one for North Face but that was a warmer top — a drier top would have done) and I don’t know what went wrong with my headtorch but when travelling with poles a spare handtorch is not sufficient. 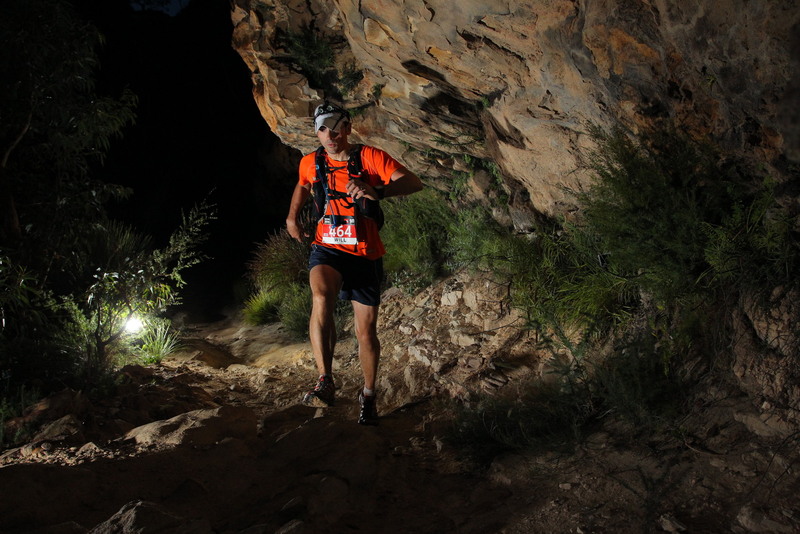 Either take a spare battery or a spare headtorch. 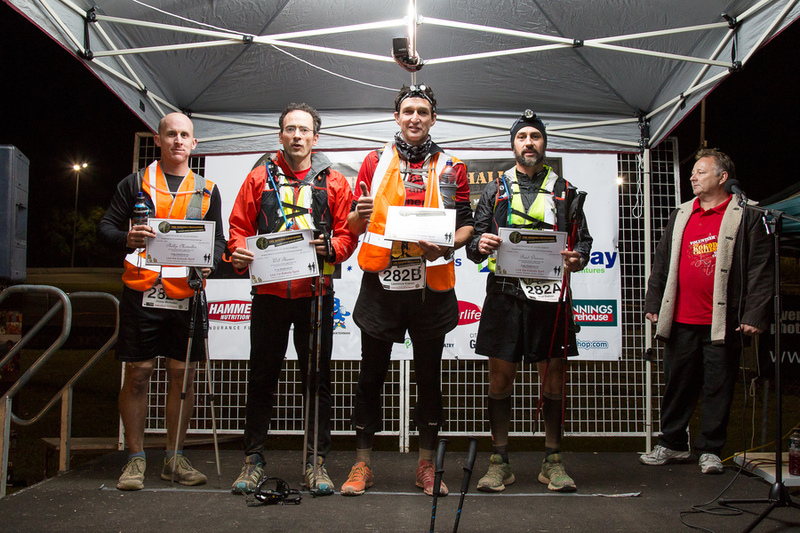 I would like to thank the organisers for rescuing the race and the volunteers who made it all happen — registration and checkpoint staff, road crossing marshals, emergency services and everyone else. All the Brisbane Trail Runners who participated or crewed, well done. Two of the three teams made it across the line in one piece, and 10 out of twelve isn’t bad. 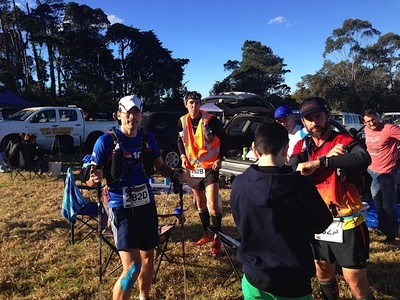 Sorry Kerno didn’t make it the whole way but given how he was doing at 30km, getting to 60km was a brave effort. And thanks to him for helping organise all the fundraising and the BTRs in general. Congratulations to my running team, Brad, Phil and Loz — it’s great that we all succeeded in beating the Kokoda Challenge. Our crew was awesome. Shayne and Josh, Danica and Lachlon, you sacrificed so much time, energy and resources into looking after us. Shayne even helped sort people’s feet out. I hope if I ever crew, I do somewhere near as good a job. On reflection, our team did quite well. Only 34% of teams finished as a four. 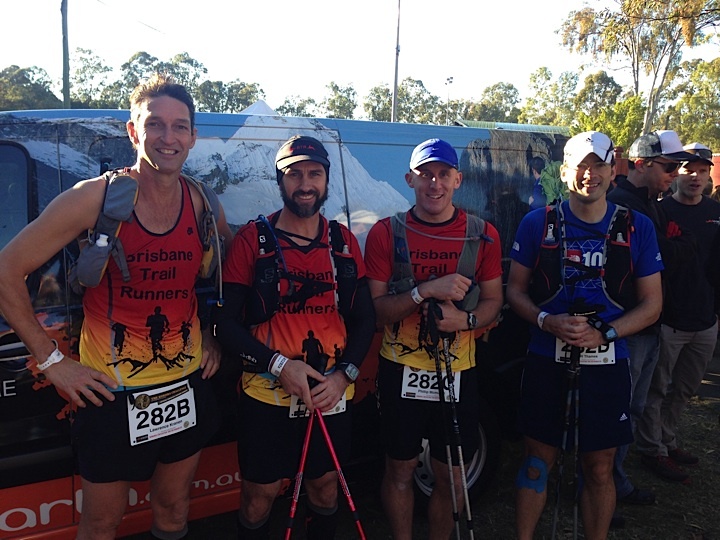 We came 23rd out of 375 teams doing the full “96km”. I was always worried how I’d do running with a team as there are so many things that can go wrong — you can end up being the slow one, there could be someone undertrained holding you up — and so our team did well on that score. One more thing — after doing the Kokoda Challenge I was curious to learn more about the Kokoda campaign during World War II. I ended up reading Peter FitzSimons’ Kokoda, a well written account describing the horrors of war with tragic unnecessary wastes of young lives, and the triumph of mateship and hard graft in spite of inadequate leadership. My GPS died at 102km — we did 105km in the end. I fancied a change of pace recently and signed up for the 14km City 2 South race - it’s quite new but well received last year, and not too pricey with the easily found online discount (got my last minute entry down to the early bird price). I hadn’t really specifically trained for it (I got chatting to a sales assistant at the race expo, who asked me if I’d been training, and what was the furthest I’d run - I think my honest replies convinced her I was ready for it!) but except for the Tuesday before the race, which was two days after my Camp Mountain marathon, when my quads were still shot, I felt I was running well enough. In terms of goals, I had Twilight Half Marathon and last year’s Bridge to Brisbane to set expectations - I knew I wasn’t 100% fit for B2B so figured I should theoretically do around the same pace - 4:30/km and be able to do quicker than Twilight which was 4:45/km. So I was thinking 63 minutes would be a good target, and even getting under 70 wouldn’t be too embarrassing as I really wasn’t sure whether I was ready for fast efforts following The North Face and the accompanying cold. I got to the race in good time - about half an hour before the start, which meant I could get right to the start of my wave, which was the second to leave. The first wave left at 7am, and we left at 7:05. I was a bit worried about congestion so I made sure I kept near the front of the wave without going out too hard. Once I was a km in I made sure my breathing felt right and concentrated on settling in to a sustainable rhythm. The first 11km or so is relatively flat with the odd lump here and there, which kept it interesting, I concentrated on not “burning too many matches”, to use Matt Fitzgerald’s metaphor from Iron War, and trying to keep a consistent level of effort. Around UQ I seemed to catch up with the back of the red wave, so it got a bit annoying for the next couple of kms with lots of weaving around people. 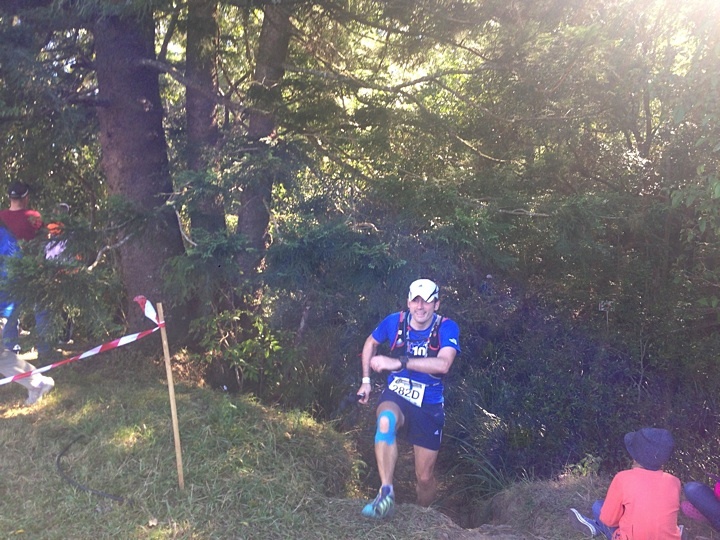 But I was still running well and happy, but with the knowledge that I needed to save myself for the last 3km too. Once back across the river, the climb started from Dutton Park to the top of Highgate Hill. All the trail running training really helped here as I was able to pass quite a lot of people, and was 149th fastest for the uphill section. Unfortunately I wasn’t able to capitalise as well on the downhill section, where I was 402nd fastest, and lost 17 places. One flaw in my race execution was that my watch was saying 13.7km at the end, so I hadn’t realised how little I had left to do - I was saving myself for the last 300m that didn’t exist. Over the line in 1:00:10, 279th out of 3827, an average pace of 04:23/km. According to McMillan’s running calculator, extrapolating that to a 15km time of 1:05, that time predicts a 3:17 marathon and a 1:33 half. Both of which would be massive PBs. My training regime has not been at all focused since The North Face, and other than hill training, very little of my training would have had much impact on speed. Two things that are worth bearing in mind - 10 hour training weeks leads to weight loss without much thinking about diet - and I haven’t really gained much weight in the last month. And the weather is perfect for running at the moment - it’s a little chilly in the mornings and evenings. Tonight, the day after the race, I did a 53 minute 11km, which is much faster than I usually manage. But with a cool evening temperature, there’s no need to stop for water, breathing is easy, and sub 5:00/km is comfortable for me. I’ll be having a week off running from Friday - I’m not taking my running kit away for our wedding anniversary. Wednesday will be the usual trail run, and I might do some Kangaroo Point steps on Thursday to maintain an edge. I’m loving running right now, so many things I want to achieve. But that will be a separate post. This post is quite long, worthy of the race it reports. Grab a cup of tea, sit down, and read on… Mostly written on Tuesday and finished off with pictures on Sunday. After my inauspicious lead-up to the race, I continued the non-training bits of race preparation as best I could, sorting out my energy drink sachets so that I had 16 bags with 50g each (thankfully I didn’t have to explain the baggies of white powder at airport security), packing my race kit and supporting my support crew. This was my first race where Peta was supporting in a participatory sense, doing more than cheering (or writing encouraging messages in chalk on the Ironman run in Zurich!). I wasn’t totally sure what I would need, but wrote some checklists for each checkpoint including location, estimated time of arrival and what things I might need. This allowed me to defer decisions such as whether I’d need a change of shoes at checkpoint 4 or 5 (or, as it turns out, at all). I could also give Peta a funnel to fill my bottles with powder, and carry warm clothes for later, and give me the food I’d prepared. All in all the checklists were pretty successful. Also in the build up to the race, I found the Unofficial North Face 100 Training page on Facebook, which led me to a great blog including preparation tips including the checklists idea. I still wasn’t feeling 100% better on the Friday, and I found the slight incline from the parking to registration at the race start really affected my breathing. However, it was also very cold, and I was suffering a little from pre-race nerves. Race registration, for me, in 2014, was amazingly efficient. I got to registration at 7pm and by 7:02 I was registered and by 7:04 I had the goodie bag. Unfortunately I then had to stick around another 30 minutes until compulsory race briefing which started late and ran long. I should have grabbed a seat before it started as my legs were sore during the night following an hour standing. I would complain more but the Welcome from the traditional owners was very moving and I wouldn’t have missed that for anything. The lovely elderly woman who thanked us for coming and loving the land was truly touching (and perhaps more generous than deserved given the amount of race litter I saw, only some of which I had the energy to pick up and take out with me). After registration I went home, we finished cooking dinner, ate, and once I felt that everything that needed to be done was done, I went to bed. I slept well for the first half and then I got hot and my leg was very painful — I was half convinced I might have deep vein thrombosis or something — but whatever it was, I never felt it after I started running. Parking at the start wasn’t great, but we didn’t have to park too far away, and got to the start in plenty of time. Although I miscounted the wave starts and thought the third was yet to go when mine was 2 minutes from starting — I wasn’t as ready as I’d have liked at that point, but sorted myself out in time. There was always a doubt in my mind that I might make no further in the race than the first 5km, which was an out and back where if I was feeling truly dreadful still, then would be the time to withdraw. The out and back was pretty enjoyable for an uphill slog (followed by a downhill slog I suppose) — we drove the same route on Tuesday morning and I thought “Wow, I ran (ok, walked) this”. Great views, fun times, lots of early camaraderie. Back at Scenic World, Peta had picked a great spot to stand — I could see her a few hundred metres away and give her a big wave to warn her I was on my way and to have the camera ready. I stopped for a quick kiss and to let her know I was feeling good and was running well, which was a nice surprise for me too. Down the Furber steps we went, the steps taking their toll on my quads, and then along the Federal Pass, past the landslide (where things got a bit slow and queuey) and then to the bottom of Golden Steps. These steps were probably the toughest of the day for me as I’d yet to learn how to deal with them, but the answer was to take more breaks, and sooner. My lung capacity due to my cold was not 100%, and that meant that it was easy to over do it. On all later uphill stairs, I did stop often and never felt quite so out of breath. Still, once at the top it was a quick jaunt to the first checkpoint, where I refilled bottles and camelbak. Signal wasn’t good enough to send a text to Peta, which I should have done anyway — I didn’t realise until the next checkpoint that the online tracker never showed me arriving at checkpoint one, and people were starting to get concerned back home! I had my one stack of the day where I tripped on some hidden obstacle and went flying. Thankfully it was mostly sand/dirt road, and I had nothing more than a graze or two and some wounded pride. A young American woman who I’d just passed stopped to make sure I was ok, and then we ran for quite a while chatting happily, which is always unexpected and pleasant. I let her go on at the 20km point so I could take a 20km selfie! 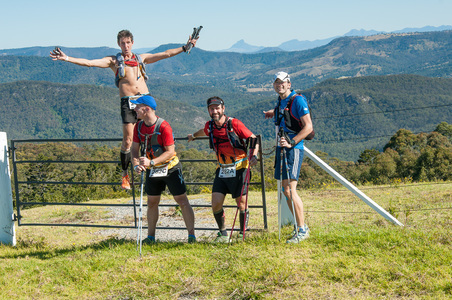 Shortly after the 20km point we had the Taros ladders. Chatting to another American lady later, if you were in a later wave the queues were bad and the detour was horrific, so I was very pleased to get to the ladders with only a few people in the queue — it was perfectly fine for me, the benefits of getting a good starting wave. From Taros to Checkpoint 2 seems utterly unmemorable now — there were lots of steps down where I felt uneasy, and very worried about later steps if I felt that wobbly there, but it turns out I recovered fine later on — I was probably still feeling Furber steps! At Checkpoint 2 I let Peta know I was doing fine (in fact I was pretty much bang on ETA) refilled everything I needed to refill, ready for the next 15km stage. The route to Checkpoint 3 was much more memorable. The hike up to Ironpot ridge looked horribly steep, but wasn’t actually as bad as it looked — Chainsaw on Camp Mountain is the same steepness, but the path is straight up it, whereas this path zigzagged. Along Ironpot Ridge we came across King David who’d given us the welcome the night before, playing his clack sticks, with some friends playing the didgeredoo, and they were very friendly and encouraging (only 65km to go! — yeah, thanks!). The run down from Ironpot ridge was probably the worst section of the race for me — completely did my knees in and might have contributed to how bad I felt for the last 20km. It was basically a steep and dusty downhill, very tough on the legs. 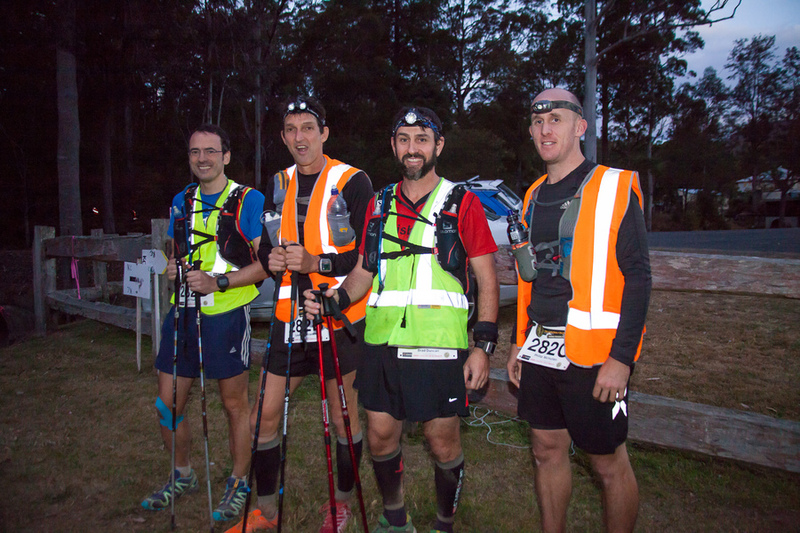 After the joys of Ironpot ridge, we had the fun of the rise up to Checkpoint 3. This was a hill that rose for 5km. I wasn’t convinced I was actually going to run any of the last half of this leg at all, but after that long 5km it flattened off and then went downhill, so I actually managed some quickish kms (it was also the middle of the day so there was a little bit of run/walk too, not to mention stops to get crap out of my shoe!) to get to Checkpoint 3. The gear check was a little bit of a faff, as I had to get my fleece out of my stuff sack, but I totally understand the point of it, so I just treated it like a mandatory rest! I had written instructions for Peta at Checkpoint 3, but only to be used if I was running at least two hours late — in the end I was bang on time. This was to save her the hassle of in my mind an unnecessary burden — it was only 11km to the next checkpoint with an expected time for the leg of two hours. I’m still very happy with this decision — it probably gave Peta more than two hours back of her day and I was still feeling great at this point. I knew any leg that was suggested as taking 2 hours for 11km wasn’t going to be easy, but then again, not much of the course is! 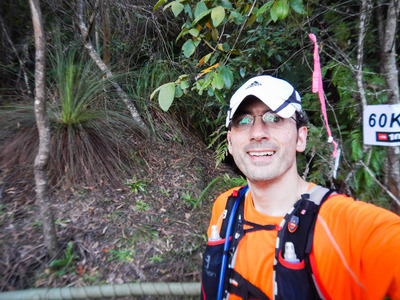 Onwards to Checkpoint 4 along the Six Foot Track, and here I met what turned out to be a great race friend, who saw me trying ineptly to take a 50km selfie and said ‘if you wait 30 seconds, I’ll take it for you’, and did so. After that we ran together for quite a bit, and also bumped into another of his running club mates, Erika, who was also very kind — she heard me coughing and offered me her inhaler — she took the offer back when I told her it was my cold, but it was really nice of her. Both Peter and Erika really helped me mentally get up Nellies Glen, which is the step-filled trudge back up from the valley to Katoomba. I saw Peter quite often for the rest of the race, until he went flying past me on the descent from Kedumba around the 85km mark — he finished half an hour before me in the end, which given his performance on uphill and downhill (I was quicker on the flat, which was no help for the last 20km!) was deserved. After Nellies Glen, it wasn’t too far to get to Checkpoint 4 — Peta was again well placed to spot me, and she saw me before I saw her for some more photos. Unfortunately neither of us knew that she’d have to take a very long route into the sports centre to be able to support me, but in the end it just meant I had a couple of minutes extra rest — and I was out again in 10 minutes or so, much quicker than the two people who left at the same time as me and started talking about their 25 minute luxury stop! Together Peta and I sorted out filling bottles, feeding me, checking off the checklist. 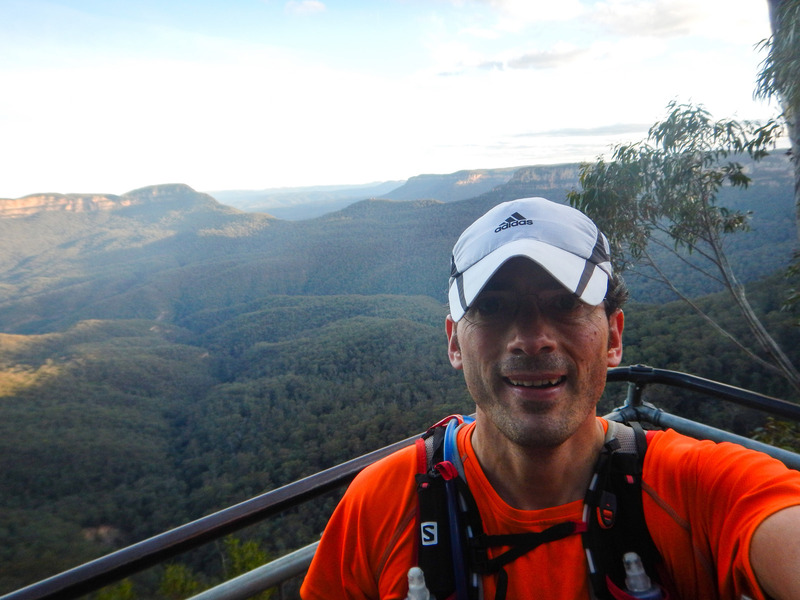 My new running friend Peter had given me a top tip, which was to try and get down Giant Stairway before dark. So I didn’t hang around — Peta and I got a bit confused when she said ‘See you at 5’ (meaning the checkpoint) and I said ‘that’s only an hour, I’m going to take four!’ but we quickly worked that out! 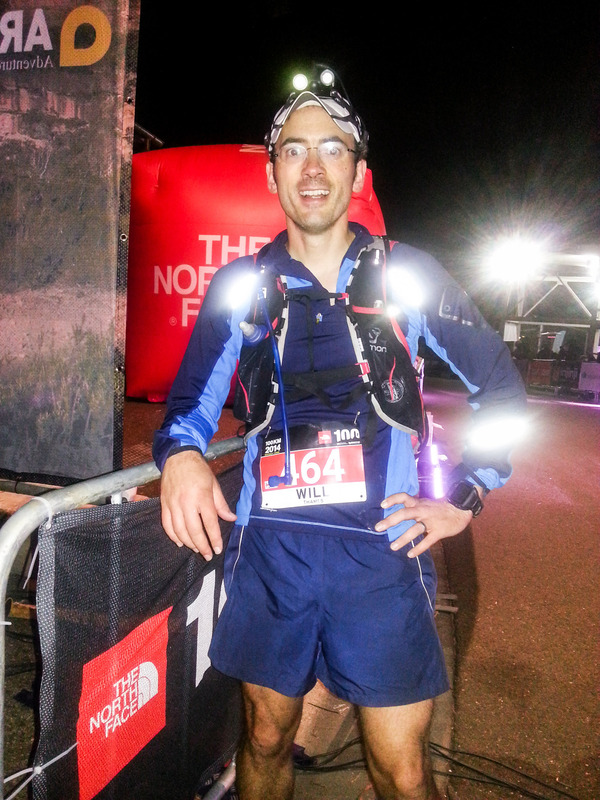 The next stage of the run was the bit of the North Face 50 from last year that I’d really struggled with. I was convinced the race director was a sadist and put as many stairs into the section as possible. This year, my frame of mind was very different — I’d trained for stairs, I accepted it as very much a key part of the North Face race, and was ready for it. And I felt happier and easier doing the stairs this year than last year, even though I’d run 20km further at that point. Sure, I forgot about blocks of stairs but I never found myself particularly annoyed by them. At some point on the stairs, we came across a cockatoo, just standing on a step. I said “Hello Cocky!”, to which he/she replied “Hello!”. So of course I had to say hello again. Presumably it’d either escaped from a family or had just learned to say hello on the trails, but it wasn’t at all bothered by all these trail runners going past! It was great to stop at the 66km water stop, where I was well looked after by Steph, a three year old, who helped fill my camelbak (with the help of her mum). After a couple more kms, I was convinced I must have passed the Fairmont and was ahead of schedule, so I texted Peta to let her know this crucial fact. Ten minutes later, I realised we’d just reached Sublime Point Road, and I was probably about on time, so I texted Peta to cancel the crucial fact. I’d likely have been more on time for the checkpoint if I hadn’t spent all that time texting! Still, I made the best of the steps down from the Fairmont, and it seemed to be a long and wiggly and windy path to Wentworth Falls, but I got there in the end, and crossed the falls for what I expected to be a long and lengthy climb back up to Kings Tableland, but it was nowhere near as bad as I expected, and it was all relatively straightforward. I walked with Peter while the path still tracked uphill, but once we got onto the roads, and it started going downhill, I set off, determined to be as on time as I could — it was a run/walk combo, but I was still definitely running at times! And then almost 10km downhill. In 2013, that 10km took me about 50 minutes. This year I was a lot slower — about 90 minutes, because I was no longer comfortably able to run downhill — my knees and my quads were just not willing to suffer in silence. I was actually happier going uphill — it was slower, of course, but I felt like I was making as good progress this year as last year. The distance between the 90km marker and the supposed 91km water point seemed enormous but at that point everything was a walk, uphill, and thus taking nearly 15 minutes to do a kilometre. I could hear people around me complain about the length of the hill, but I was at peace with it — it was a long trudge but I preferred it to the succeeding flatter section. After the climb came the clearing, and then upwards again to Federal Pass, which felt pretty comfortable. 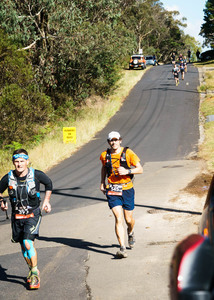 The run through Leura Forest felt fine but I really slowed further for the last 5kms — I was stuck behind some people but really didn’t have anything left in my legs to want to overtake. Finally I got to the Furber Steps and tried to text Peta. But no signal. So I proceeded up the steps, and then tried again. No luck. A bit further, I tried again — still no signal. Higher up, I received a text from Peta, so I stopped and tried again. In the end, I got to pretty much the top and called Peta to warn her I was on the home stretch. So, top tip for any TNF 100k-ers — make better arrangements to meet at the finish. I’m not sure what else I could have done, because I was much slower over the last 5km than I expected, but at least I might have known not to bother trying any earlier. Still, I needed some rest stops on the way up, but probably not quite that many. And then I was walking up the boardwalk to Scenic World, and saw a sign saying last 5 steps, and so started running — I bounded up the steps, and then finished strong nearly across the line, pausing slightly to let Peta take a photo, and then crossed into her arms. After some uncertainty about what happens next, I went to collect my medal, and bumped into Peter on his way out, so it was great to find out how he’d done. I then had the best chicken soup I’d ever had (another top tip — have chicken soup as a meal — the meal I prepared myself was very stodgy and unappealing). Peta then drove me home, ran me a jacuzzi and opened the bottle of fizz that we had in the fridge, and all was good with the world. I also took the opportunity while the jacuzzi was being run to catch up on all the vast amount of good wishes that people had left on Facebook, it was lovely to feel so well supported. Gore Running long sleeve with mitten cuffs — good for the first 2km when I was cold and my hands were wet after the checkpoint, too hot afterwards. Should have just worn running gloves for a couple of ks. Ronhill shorts with just a little inside flap as a pocket — didn’t think I needed pockets given my backpack but they’d have been good to keep e.g. gloves in. Salomon Crossmax shoes — probably one of their last runs — they’ve done over 500km since I started tracking my shoes at the start of the year, it’s probably nearer 1000km in their lifetime. And even Peta thinks they look like they need replacing. X-Socks marathon. 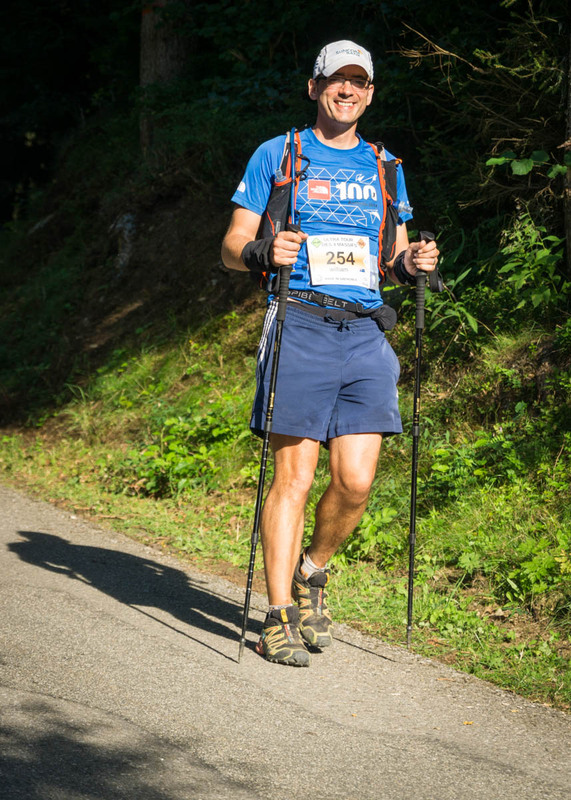 Great, although perhaps a little short for this event as grit got in too easily — but so so comfortable on the feet. Neutrogena Beach Defense spray on sun protection. Allows me to sweat with it on, which beats most sun cream. Skin slather lube. I had no chafing where I used this, and it quickly resolved where I missed using it. I was pleased with my nutrition/hydration choice. I’m not at all affiliated with Tailwind Nutrition, but their product works for me — I had something like thirteen out of the sixteen planned pouches. 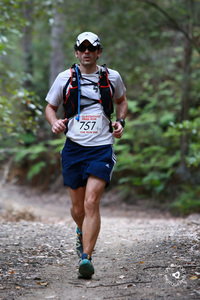 I did get a bit peckish around the 70km mark, and had a Boost. I also had a little of my sausage and potato food, but really not very much. 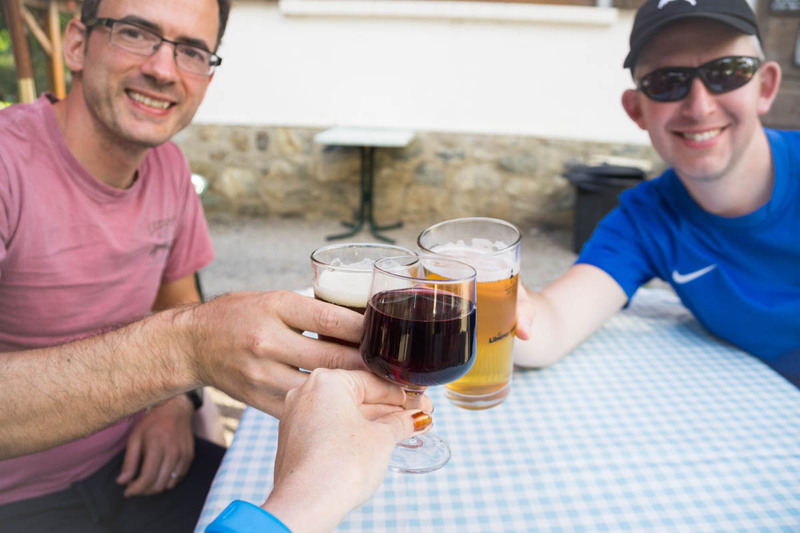 It was easier to keep on top of the required amount of Tailwind when it was warmer — probably the 70km flagging was because I had only drank half the amount I should have from the 56km checkpoint. But I think chicken soup at Checkpoints 4 and 5 would have gone down well. I don’t feel the need to do that particular 100km again, although I’ll never say never. If I thought I could get a silver buckle to go with my new bronze buckle, I might, but shaving nearly four hours off my time seems near impossible. 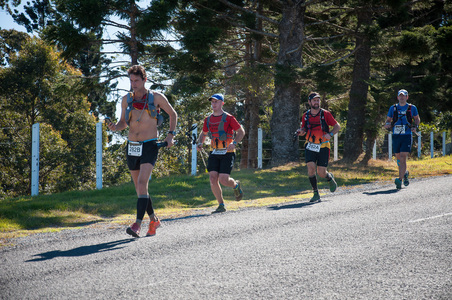 There are so many great races to do that would be difficult to do in the same year that I also want to do — Tarawera and Cradle Mountain being two off the top of my head. And I’d also like to try some of the other Blue Mountain races, such as Mount Solitary or the Six Foot Track. On North Face 100 preparation, aside from my cold, which may well have been a blessing in that I was definitely well rested and couldn’t go too hard early on (I felt much better later in the day, perhaps after I’d cleared myself out), there are some things I’d suggest. Very steep downhill training (I can only think Chainsaw) but that has its own risks — either of falling or just damaging knees in the practice. More step walking. I did plenty of stair running (it’s probably impossible to do too much but I felt I did enough) but specifically downstairs walking, preferably with unevenness. 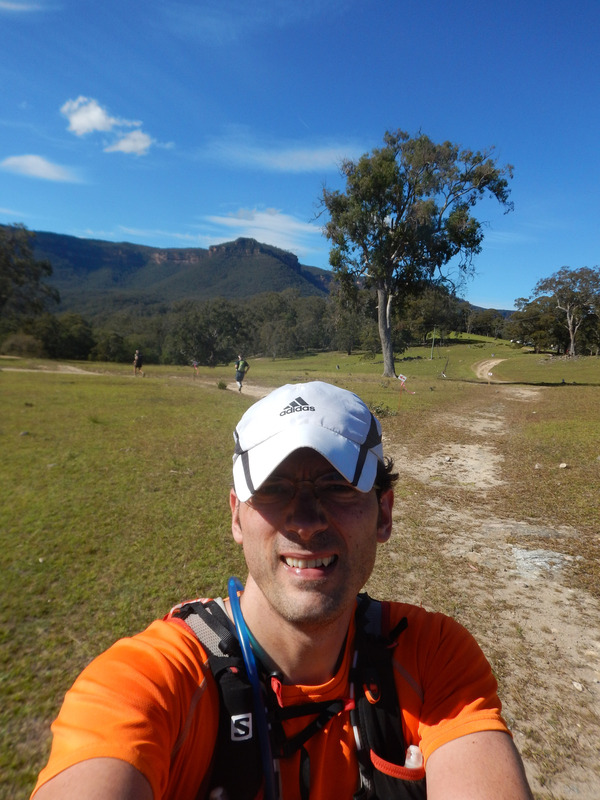 Also more downhill running training — the 10km from Queen Victoria Hospital to Jamison Creek could have felt easier. Other race top tips. Wear gaiters. The amount of time I spent getting crap out of my shoes was probably getting towards 10 minutes. And grit got in the top of my socks and rubbed the tops of my feet such that I’m wearing blister plasters there now. Peta and I worked out the support strategy quite well for a first time. Having spare bottles and camelbak would have meant we could just do bottle swaps rather than me having to fill them (supporters weren’t allowed near the water). And the 99km texting was a lesson hard learned, that I should have realised given the paucity of the GPS signal down there, but no regrets. Unlike in the 50 last year, where I swore to give up trail running, this year I felt happy and confident the whole way through. I never felt like I would need to give up (although how difficult I found the first stair climb gave me some cause for concern, and my legs felt a bit shaky on some of the technical downhills around the Taros steps, and I worried that they’d feel worse later, but neither worry was serious nor, in hindsight, warranted!). I don’t recall many races where I felt so capable! Thanks to Peta for providing the middle ground of being suitably cautious about my crazy ideas, but going along for the ride once convinced. Her support on the day and indeed the days afterwards has been invaluable. We’re going to have many more adventures together, and more holidays in the Blue Mountains where I can actually do some decent walking with her! I would like to thank the traditional owners of the area for their heartfelt welcome and the work they do to conserve the land for generations to come. The organisation of the 2014 North Face seemed even better than usual (I think the change of venue helped them) — it was well marked, everything was smooth (except perhaps the direction at the finish, but when I did ask what to do next, they were very helpful). I think Tom and Alina and everyone involved do a fantastic job. 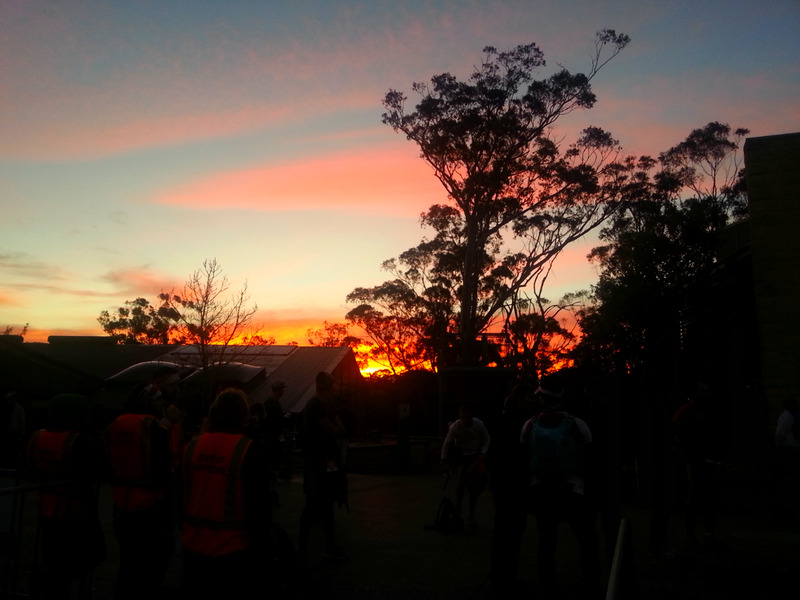 I’d like to particularly thank everyone who volunteered their time as marshals, at checkpoints, and start and finish. My new friends I made on the race — I’ll probably never meet them again but Peter and Erika from Sydney Striders, Charlene who made sure I was ok after my fall, Ariane who helped me sort my light out and the other people with whom I walked the slow climb from Leura Valley, whose names I never knew, it was still great! 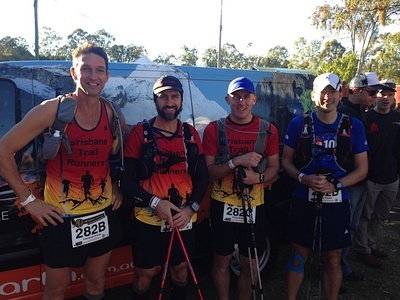 The Bunyaville Trail Runners have been a great set of training buddies — so thanks to Grant for doing a great job organising it, and to everyone on the weekly runs, plus particular thanks to everyone who’s gone on a long training run with me — Aaron, Paul, Brad, Stuart. Oh, and a big thanks to Shayne for his valuable mantra ‘Trust in your training’ which spoken by him sounds like an instruction from a Jedi Master. This year most of my social running has been with my trail buddies, and I’ve had to neglect my parkrun friends to concentrate on longer things (and avoid the risk of injury from short sharp runs!). 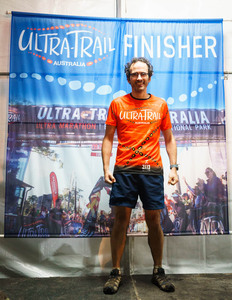 I’m looking forward to going back and seeing everyone, and I’d like to thank Brendan Smith, a fellow endurance runner who’s just come back from doing two marathons in China (including a ten hour effort on the Great Wall — lest anyone think he’s a slacker, the winner did it in six!) who said ‘Bragging rights are forever’, another helpful mantra for my run, and much more positive than drug cheat Armstrong’s ‘Quitting is forever’. Thanks to everyone who liked or commented on Peta’s updates on Facebook — the tracking that Peta did was more up to date and accurate than the official timings, and she was able to let me know how much everyone was cheering me on. And I did really enjoy catching up on it all after the race, so thank you all! (Peter) — Peter, a guy I met on the run. Don’t yet know his last name. Uncredited photos are self-portraits by me. My last run was now a week ago — a good variation on the usual routes at Bunyaville. My plan for Thursday was to have another go at the Kangaroo Point steps, and then 20km at the weekend for a casual 50km for the week. I started getting more and more snuffly around lunch time on Thursday and when I coughed, it was pretty chesty. I very nearly went running in the afternoon but thought it best to leave it. On Friday I still wasn’t terrible, but I was getting worse, and Saturday and Sunday were very coughy and raspy. Anyway, long story short, the cold itself seemed to properly kick in on Monday with the full on sneezing and sniffles and general bunged up ness. The cough hasn’t fully gone away, certainly not enough to want to risk running at this point. I haven’t been to work all week — by this point not because I feel too unwell to work, but because I am too unwell to be in an office spreading my germs to everyone else. I’m hoping to squeeze in some kind of run, no matter how short, in the next day or two, but I’m erring on the side of caution — I’d rather have ten days off running if it means that I’m ok to run on Saturday. There are some positive things to take from this. I’m not injured, just ill. It’s presumably just a cold, so I should recover soon. Emil Zatopek discovered the benefits of tapering through a period just like this, and significantly beat everyone else in his race. So I could totally win the North Face 100 as a result of this downtime. I do have to take care of my body — I’m very hopeful that I’ll be on the start line on Saturday morning, but I’m trying to avoid the risk of bronchitis or pneumonia for a race, so I’ll be making the decision to race carefully. Either way I’m sure I’ll have a wonderful time in the Blue Mountains.